You wake up around 3 o’clock at night to the sound of your fellow rider chocking. Within a few short seconds you realize that the sounds emanating from the other side of the room are actually very prominently the sounds of a cyclist snoring. There are risks to touring with a group of guys you don’t know all too well and they are all more than worth it. The whole adventure, later to be named The Vicious Circle, started with an email in which a friend asked if you’re interested in an off-road tour around the city. A full loop he promised, with almost no paved roads what so ever. It nearly sounded too good to be true which is why you immediately expressed interest and secured a spot. As is often in life, things got hectic, travel was involved and you almost forgot about it, until the email with the GPS tracks and the road sheet arrived. The plan was a 4 day ride, each day ending in a different corner of the surrounding land: east, north, south and then west. On paper it looked sublime. The tour started on Thursday morning, not too early and not too late, in a small town just south of Berlin. 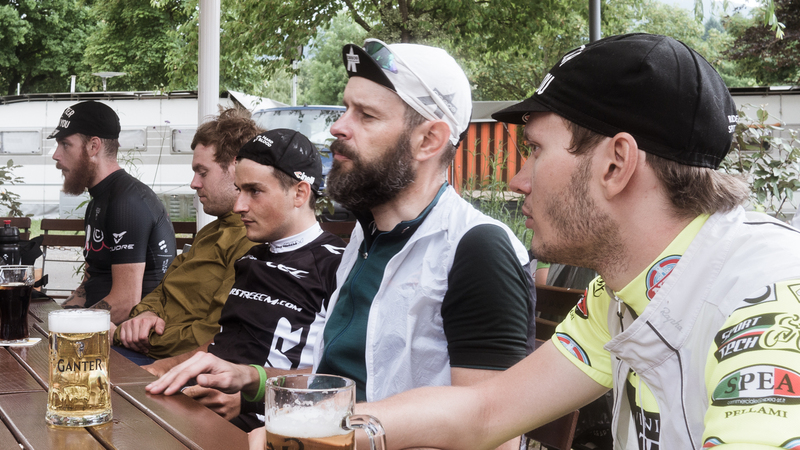 Both groups, the Berlin crew and the Leipzig crew, met at the train station and after a quick round of introductions and a coffee you were on the way. 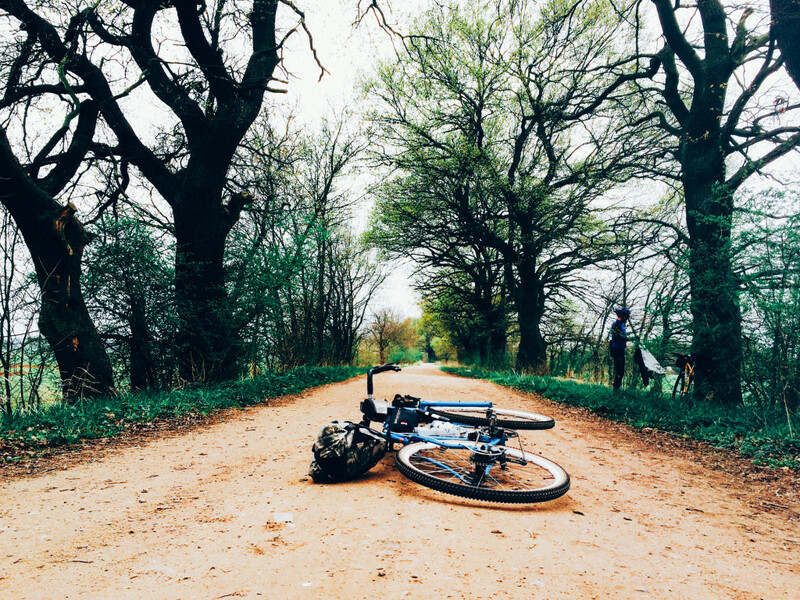 18.5 kilometer later, while riding on a nice forest road just south of Potsdam, a tree branch decided to jump into the rear triangle of the Hunter taking with him the derailleur hanger and breaking a spoke in the middle. Making hardware-related decisions on the trail is never a good sign, but the crew put on their thinking caps, turned a few screwed and within 15 minutes Hunter was turned into a single speed off-road touring machine. 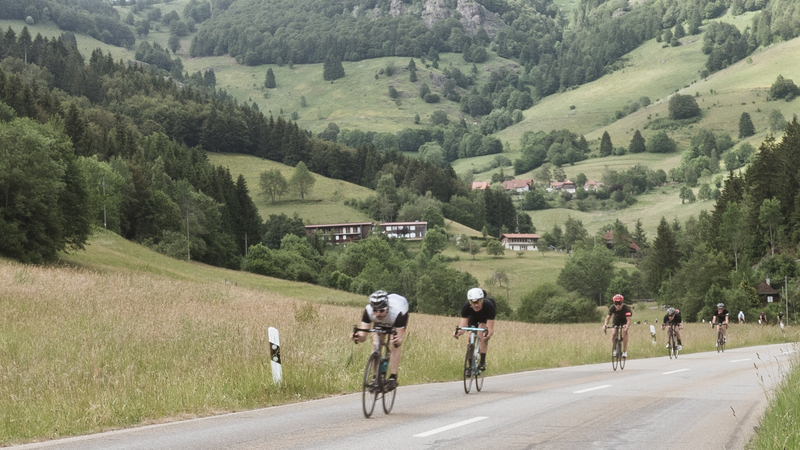 This helped releasing the crew from their desire to leave no man behind and you ride to the train station, head straight to the local bike shop, change the broken spoke, replace the derailleur hanger and ride out to the overnight location planned for day 1. Someone once said “yes we can” and he was right. 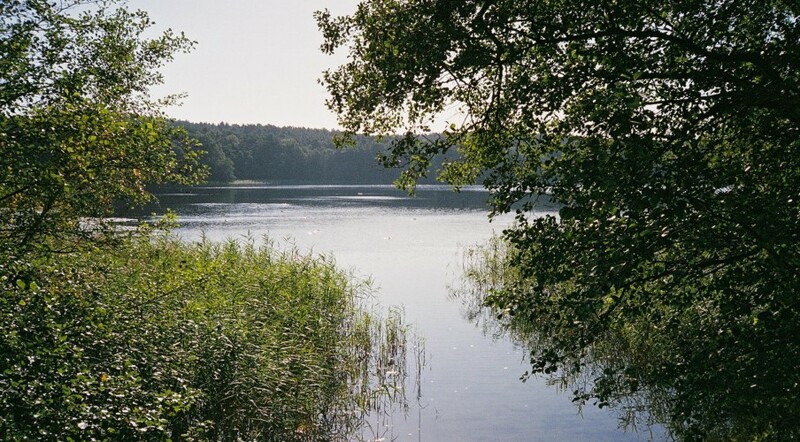 The next three days are spent enjoying the great outdoors in the lovely state of Brandenburg – the German state that surrounds the capital. 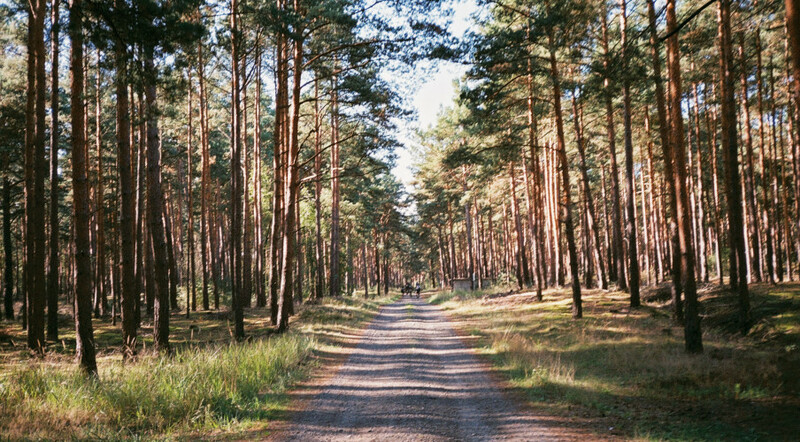 You ride on nicely packed gravel roads, single tracks, forest dirt, military plates that are probably there since the days our country was split into two, thick sea sand that’s nearly impassable, a few proper cycling paths and probably a few more paved roads than were planned. 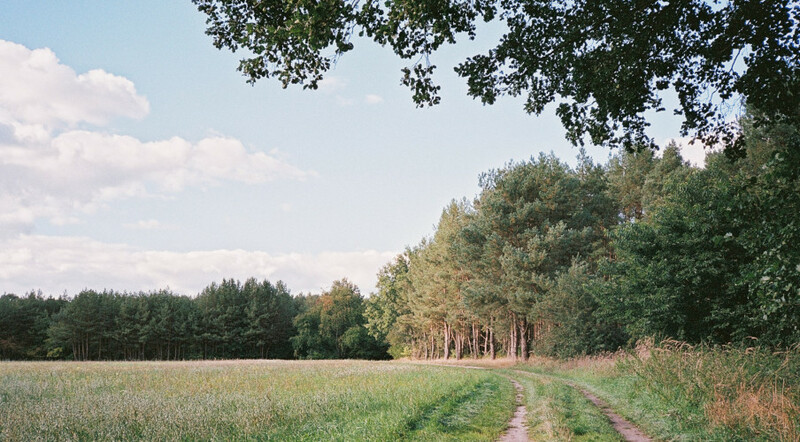 You are often tempted by the silence in the woods and tend to let the group plow ahead while you hang back, taking pictures and trust that at some point a cafe or country-side bakery will stop the pace of the team. This system never fails. The tour manages to find the most exciting and interesting non-roads in the backyard of the capital. The whole crew is elated as you realize, on day three, that somehow you managed to climb 1,000 meters in an area that’s well known for his flatness while also discovering beautiful lakes and fall foliage. Each accommodations are an improvement on the previous night which turns the whole adventure into almost luxury touring, but that just means that the crew is more energetic the next day and is rolling with gusto onto the next track. 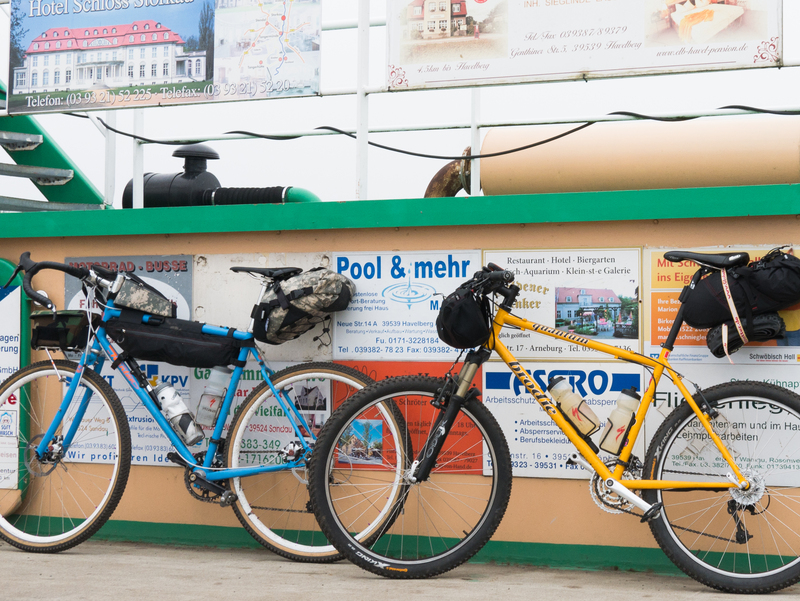 By day 4 discussions about the next tour, planned for next year, are already underway and as you roll into the same train station the tour started off, you feel a sense of nostalgia before you even dismount the bike. Such tours, with minimal yet epic mechanical failures (two derailleur! 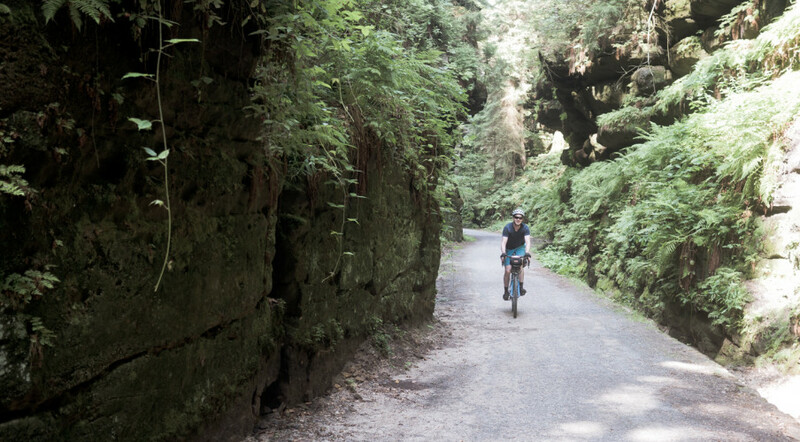 ), with a solid crew, with enough time for snacks and photography, a rag-tag collection of off-road steel rigs (and one aluminum bike), and beautiful nature are after all exactly why we ride. 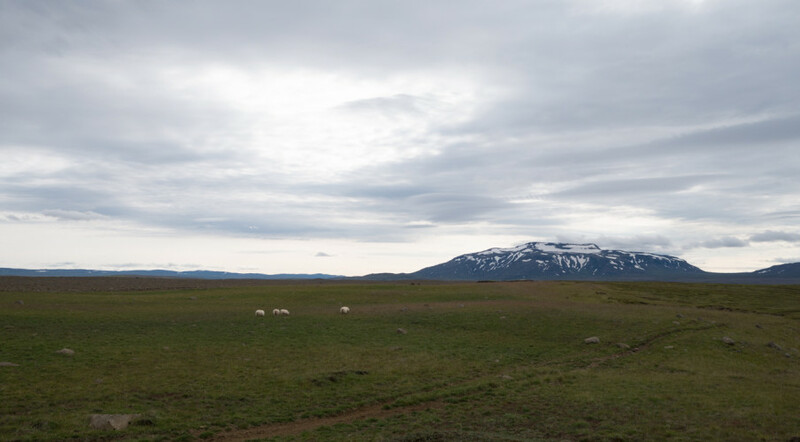 You wake up in Borgarnes, western Iceland. The wind is pounding the camper and the tent that was pitched the night before right by your camper is now gone, its inhabitants curled up in their car. Gashes of wind manage to shake the camper so much that you both agree to stay in your PJs and drive about 25 kilometers to a much more civilized camping area you accidentally found the night before. 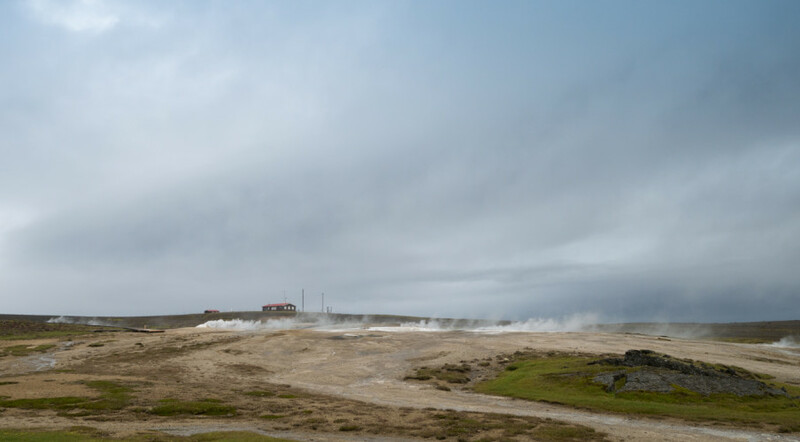 The wind in Iceland is an element to be taken into serious consideration. 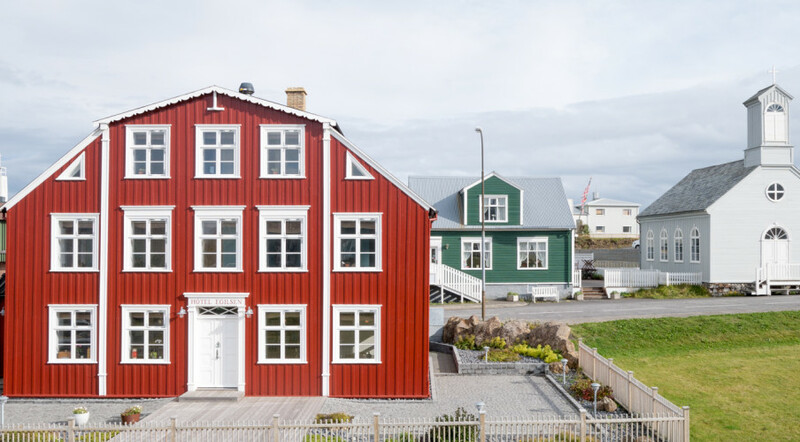 Only 6 days have gone by and you are already attached to the Cozy Camper highlander you rented in Reykjavik. It has been christened Claus Camper and is commonly referred to as Claus. Claus is a Hyundai Starex 4WD van that has been converted into a very cozy and comfortable camper while keeping its ability to roam the highlands and various F-roads without fearing for one’s life or invalidating the rental insurance. In fact, after a few nights in Claus, you both agree that Claus is really the only viable way to explore this beautiful country. Claus took some getting used to as the only rental cars you’ve ever driven were in the U.S. of A where cars are automatic and Claus is one of those manual transmission vehicles, but given the 1780 km you drove, getting used to manual was no biggie. 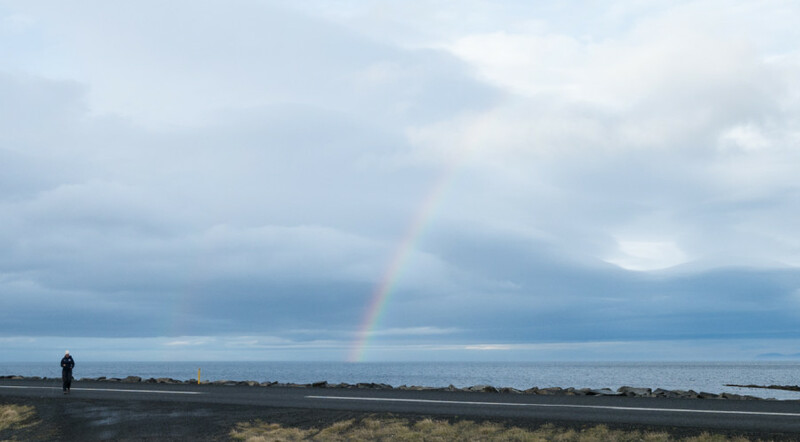 After landing at Keflavik airport with Iceland’s “cheap” (nothing is cheap in Iceland) and friendly airline – WOW Air you take the Fly Bus to Reykjavik where the owner of Cozy Camper awaits with Claus and hands over the keys and instructions. The final payment is done on site using one of many mobile credit card readers you will meet in Iceland and you take off. 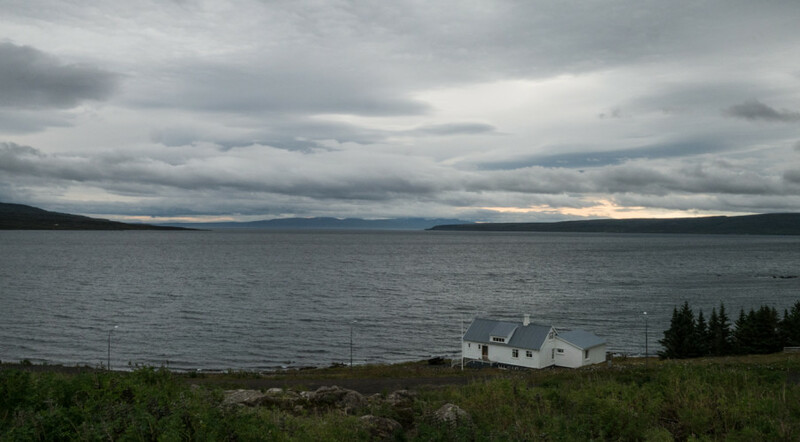 Looking at the map, the nearest and largest body of water that is not the ocean seems to be Þingvallavatan and since it’s already early afternoon and you practically have no plan, you purchase some provisions to stock up Claus’ refrigerator and head out of town. You arrive to Þingvellir a short hour later and camp at the first camp ground of many. 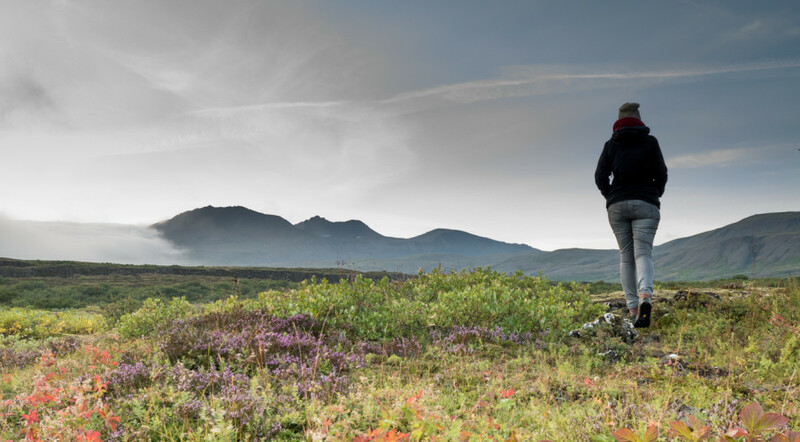 Every evening follows the same ritual – you arrive at a camp site, pay the ranger about 1,200 Icelandic Krone per head and park Claus. Leading up to this amazing adventure you discussed the idea and suggestion of a friend to rent a 4WD car and sleep in a tent. The lady injected some sense into the misguided and mostly romantic notion that you are someone who could build a tent and enjoy sleeping in it, which is how you came to rent Claus and leave such things as tents and cooking utensils behind (Claus came with everything one needs to cook). 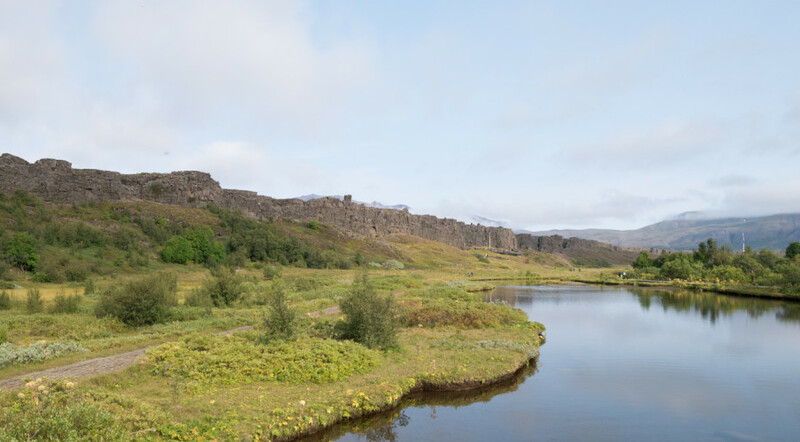 As you set up camp in Þingvellir, an act that involved parking the Claus somewhere basically, you realize just how much this was the correct decision. By the time you wake up the next day, counting a few tents less in your surrounding and seeing other road warriors sleeping in their car seats, you really appreciate that decision making process that took place all these weeks ago. 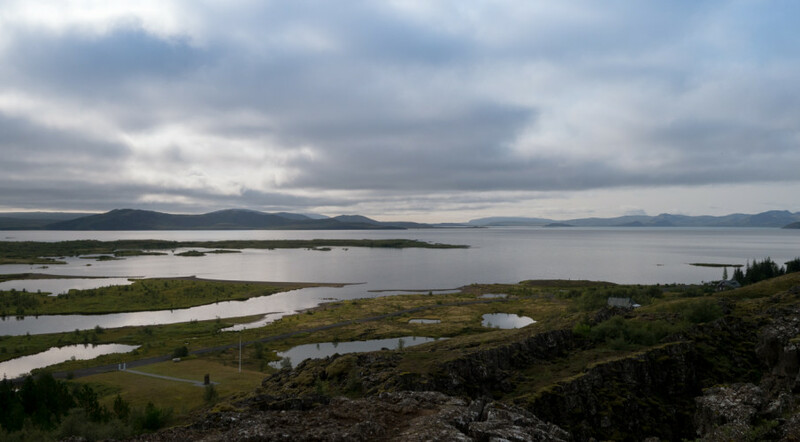 The first day on the road therefore starts in Þingvellir, a fascinating location both geographically and historically. You literally park Claus in a valley that lies between the two continental plates – the North Atlantic and the Euro-Asia. 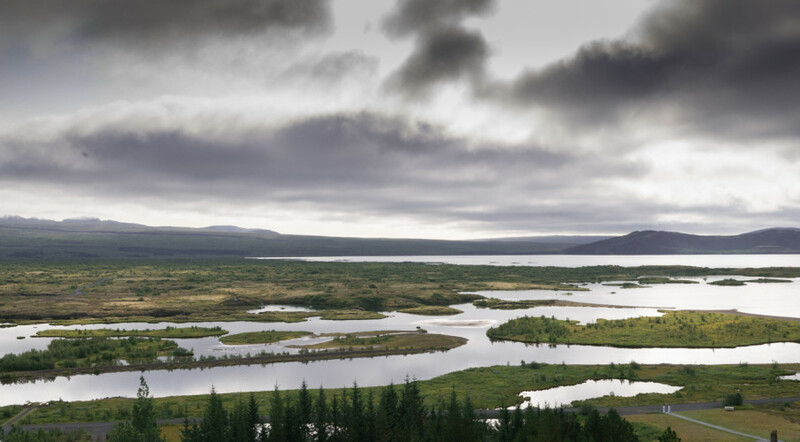 Þingvellir is also the location where the Alþing general assembly (i.e. a parliament) was established around 930. Pretty much every historical event of any political significance to Iceland took place in this general assembly. The location is as mesmerizing as it is powerful. Being able to actually see the North American continental plate ends and the Euro-Asian begins is a nice way to understand a little more about our little planet. 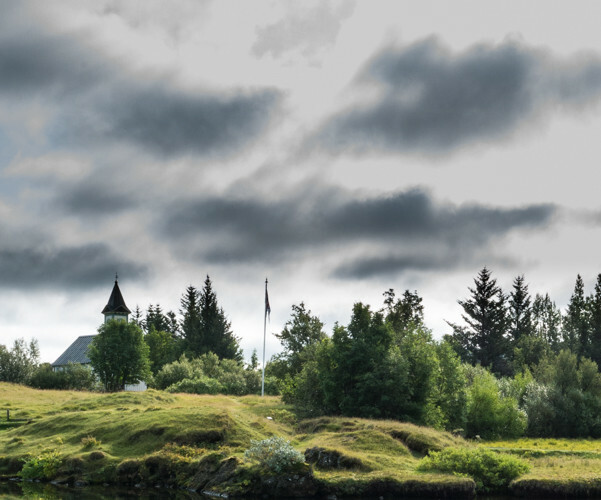 At the same time, seeing the place where the vikings used to gather and democratically make decisions is a powerful reminder of the foundations of Northern Europe. Democracy and community are ingrained into the European continental fabric. Taking all these in and snapping loads of pictures, you jointly decide to head to the highlands while stopping on the way by two popular locations: Geysir and Gullfoss, the first is probably the world’s most famous geyser – all other geysers on the planet are named after that one, and the second is a picturesque waterfall, one of many to be seen in Iceland. And just like this you leave civilization behind and start the drive up the highlands. 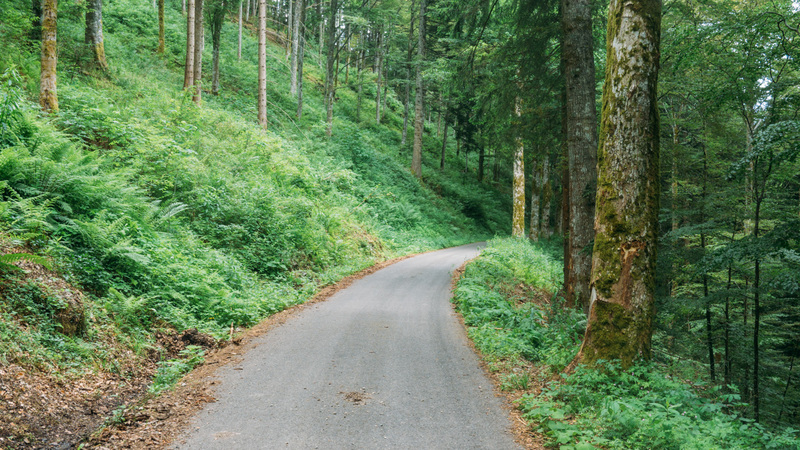 This is where the road gets…interesting. 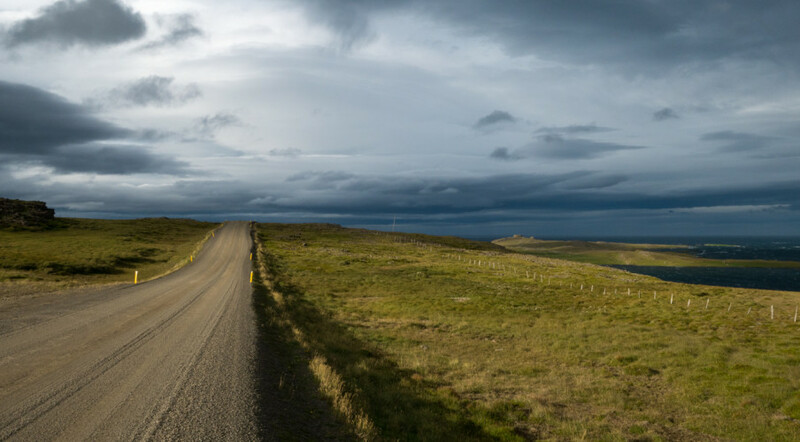 Iceland, with a population of 320,000 inhabitants, harsh weather and a great deal of active volcanos, approaches roads in a slightly different manner than the rest of Europe. There is one road the circulates the whole country. It is called The 1 and is almost continuously asphalted. 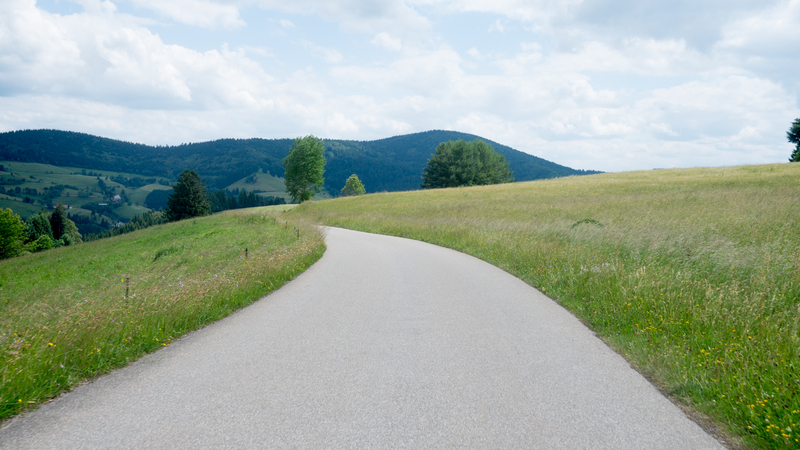 Then there are local roads which are often packed gravel and then there are the F-roads. The roads to the highlands are the latter. Here one could expect anything – rivers crossing the road, streams flowing inside the road, huge boulders, puddles that could cross the whole path and many areas where you have no chance to spot the driver coming across from you. These were our preferred roads. After some 90km up the F-road you get to the camp ground you intended to reach and are excited to see that the location has a small restaurant that serves fish soup, probably the best one you tasted during the whole trip, as well as set dinner. Menus are for civilization. You park the Claus and set your priorities straight – get into a bathing suit and hit the hot-pot. 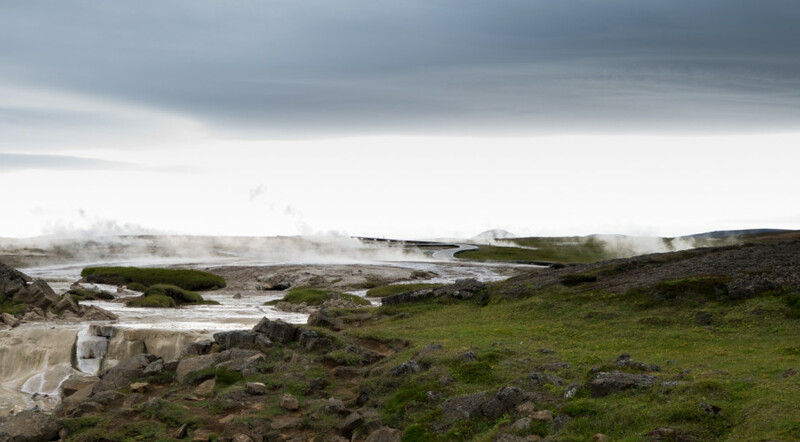 Hot-pots are a bad translation which you assume comes from Icelandic and are referred to by the locals everywhere. The term is similar to the word Handy in German which actually means mobile phone, but somehow takes on an English word that has no direct relationship to what it actually describes. Since hot-pots are, for all intended purpose, a dish served in Chinese restaurants, you have a hard time referring to heated bodies of water as such. 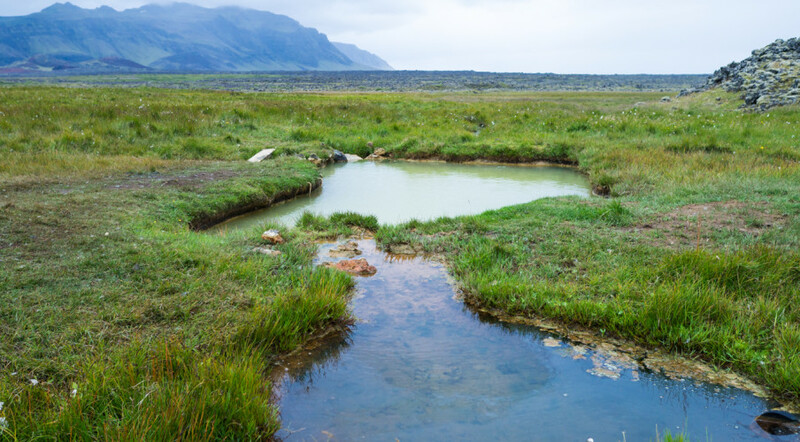 The natural pool at Hveravellir has three large plastic pipes leaning into it. One pipe brings in water at almost boiling temperature while the other two spill colder water. 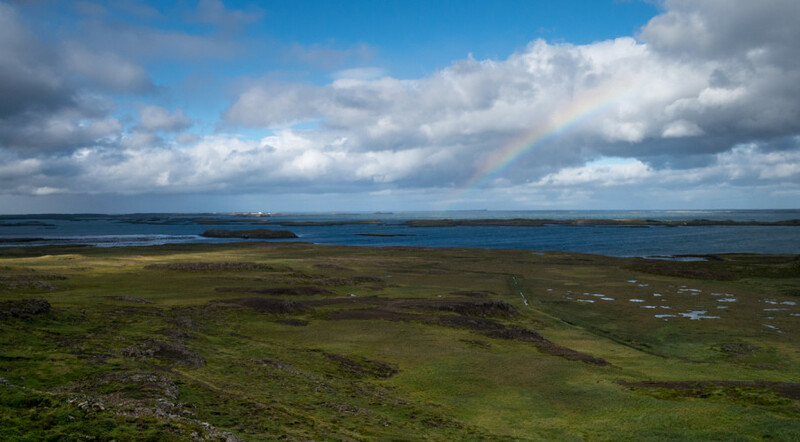 All water sources are natural and as we quickly learn, all water, hot and cold, is brought directly from the earth on this magical island. So you spring into the water, push the colder pipe away and let the pool heat up and enjoy a beautiful evening in an outdoor! heated! natural pool! After about an hour you are joined by a few more travelers and discover that you are surrounded by other Europeans. 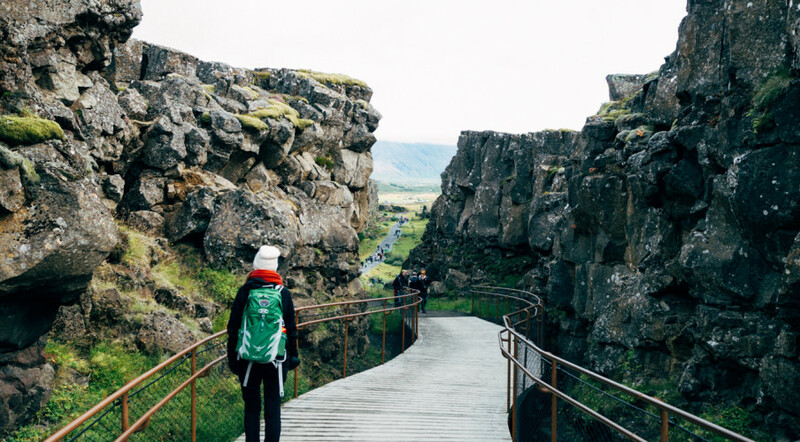 You take your leave from the first hot-pot, change, stroll through a steamy and very active volcano area, grab some food and loosely plan the coming day. 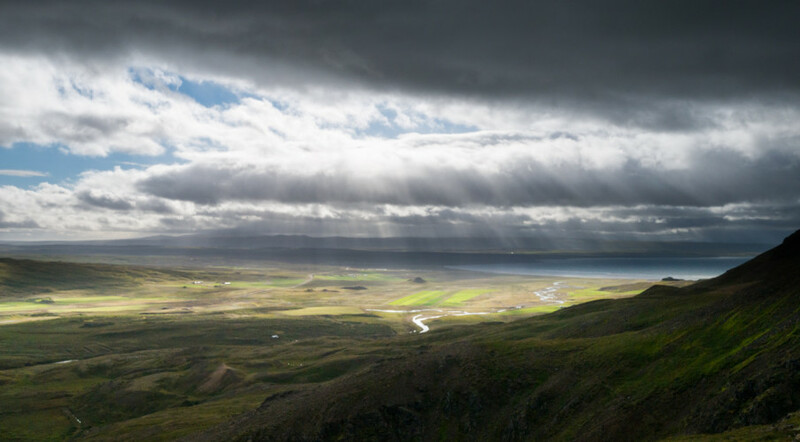 You know that you still have about 100km to get out of the highlands and into the Northern part of Iceland, but after that the plan is cloudy. You decide to postpone the decision and just agree to see how you feel when you get to the end of the F-road. The next day starts with a 100km drive through the highlands on F-road 35. The northern part of the road is much better than the southern part so you make good time and stop for a few photo opportunities. Right before the road reaches the ring road, you spot a massive power station and a plaque that explains that Landsvirkjun is responsible for 75% of the power produced in Iceland! 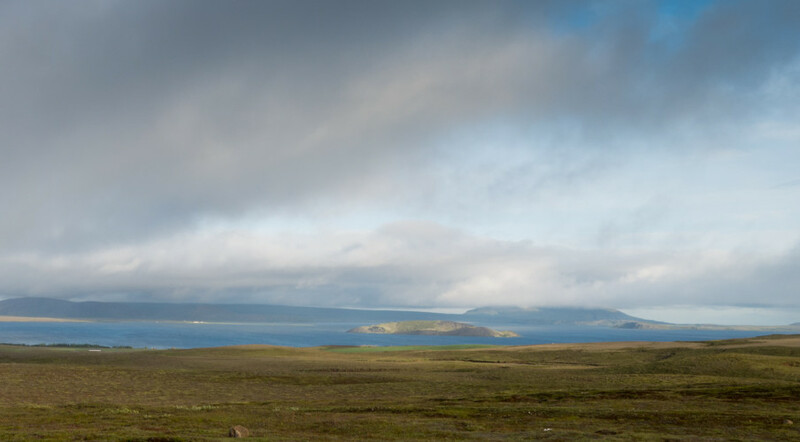 After a short drive you reach the northern part of the ring road and start heading east. 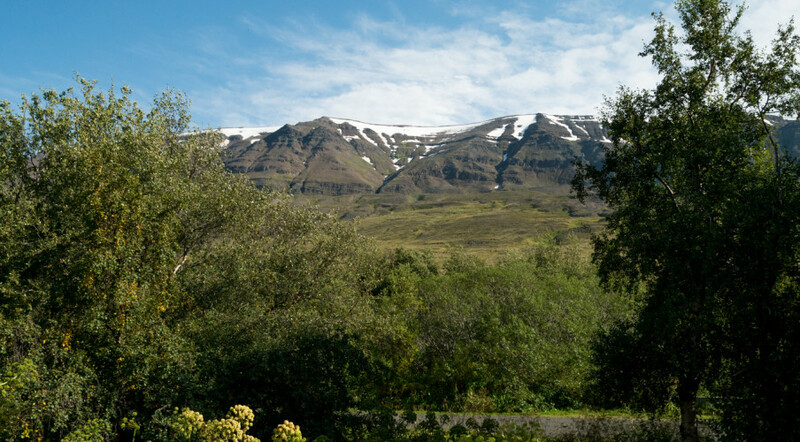 You pass Iceland’s second largest city – Akureyri, a city of some 18,000 inhabitants and continue eastwards. 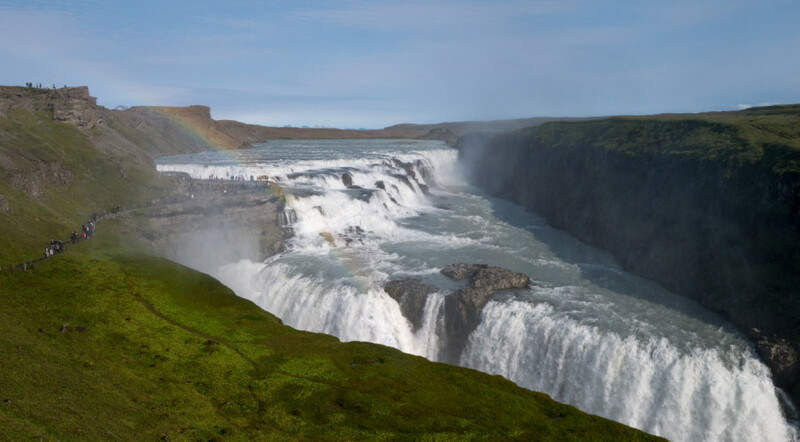 Since a day without a waterfall seems like a wasted day, you stop at Goðafoss (waterfall of the gods) and take the “other” route to the waterfall. 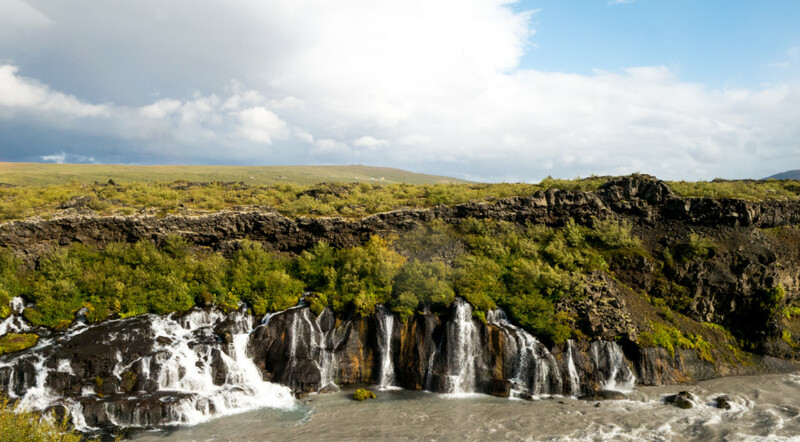 As in pretty much every waterfall in Iceland the power of the water is palpable by just standing across the fall and the almost green color of the water is breathtaking. 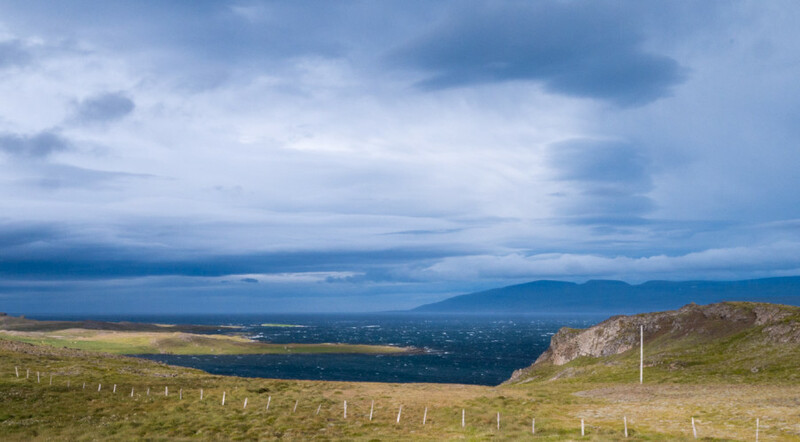 Further east you drive until you reach the shores of lake Myvatn and the tiny settlement Reykjahlíð. 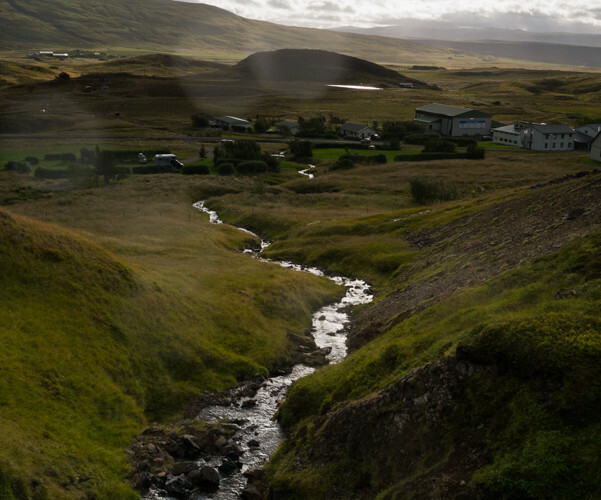 Even though the town is smaller than petit there are several camping sites to choose from and you settle on the one with the lake front view and the lush green grass (Bjarg Campsite). Once the location for the night is identified, you move on to the next essential aspect of your stay – finding the nearest hot-pot. 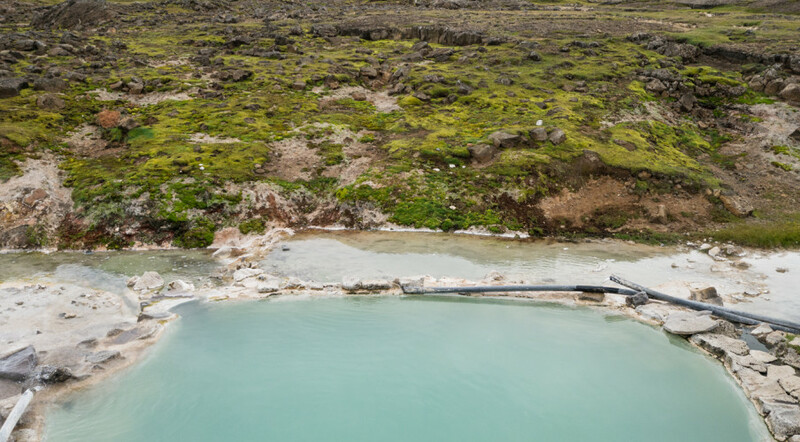 As it turns out, and this was entirely unknown to you, the Myvatn Natural Baths are the northern version of the world-famous Icelandic Blue Lagoon. As you drive to the baths you can close your eyes and let your nose do the navigating. 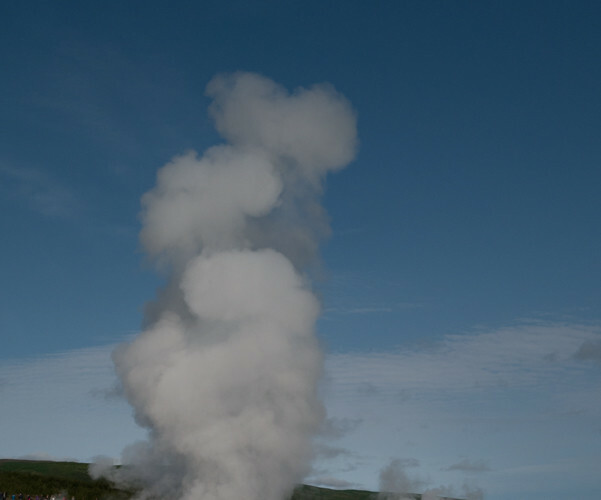 The area smells of sulfur and clouds of steams raise everywhere in the area. The bath is huge and as opposed to the previous night, is not so private. You endure the crowd and look for the source of the hot water. In the east corner of the bath you find the source and enjoy a good area in this beautiful location, watching the sun set over the lake. Now what could make a hot-pot experience even better? A great dinner post the hot-pot. Again, as if by accident, you let the Internet recommend a location for dinner and end up in a farm house called Vogafjos Cowshed Cafe. The restaurant shares the same building in which the cows are housed. You can watch the cows eat while they can watch you. The food is practically the best example of farm to table you have ever experienced and the fish and local cheese is delicious. After such an exciting day you have no problems falling asleep back in the campground and sleep in pretty late on Sunday. When you wake up on Sunday you realize that you need to spend a day in the area, not a bad realization to be had on a sunny Sunday morning. The reason being that you managed to forget one of the most important elements of a great adventure at home – a charger for the digital camera! Since the only possibility of finding a charger is in Akureyri, and since it is Sunday, a day on which the shops are closed, you just have to hang out in the area. And so, the day turns into an awesome combination of things that you could only really do in Iceland: a walk up a volcano, a quick photoshot in the cave in which Jon Snow, one of the heroes in HBO’s Game of Thrones, looses his virginity to Ygritte (the place is called Grjótagjá, good luck spelling that in google maps), a walk to the most powerful waterfall in Europe (Dettifoss) and a magical nature stroll in Asbyrgi canyon. The beauty and power of nature, all in a single day, were almost overwhelming. 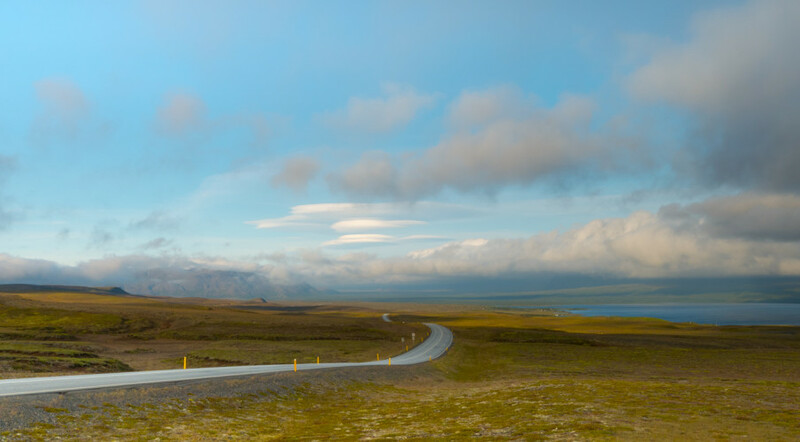 The day also included a nice F-road trek from Dettifoss to Asbyrgi following the rule of “if the road ends, you just continue driving”. Evening rolls in and so is the Claus. 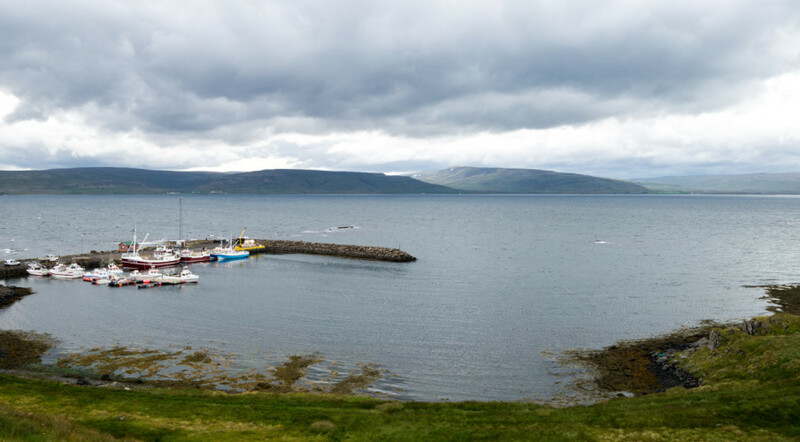 You park in the Husavik camp ground which is organized and friendly, but is somewhat disappointing as it is right at the end of the town. 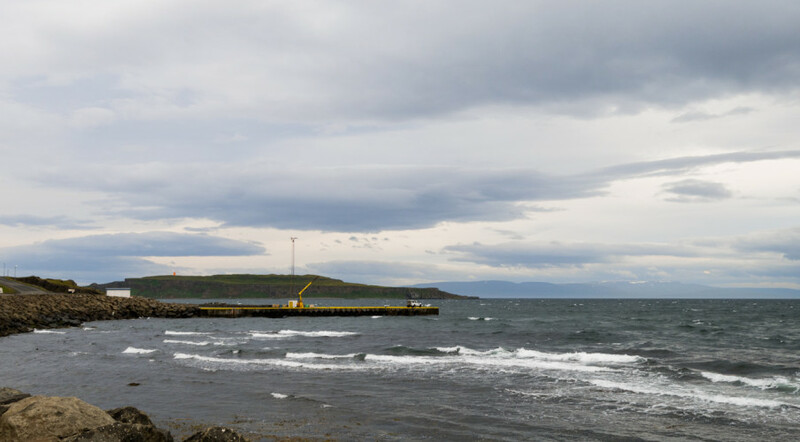 The town is clearly focused on tourism and its tiny harbor is housing at least 3 different whale watching companies which is impressive for a town of 2,237 inhabitants. You get out of town on Monday morning and head back to Akureyri, find a charger for the camera, and align the stars back to their natural order. 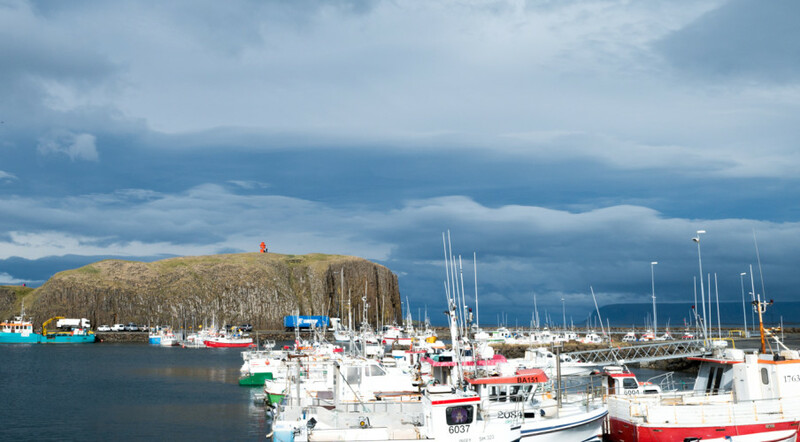 Over fish and chips lunch, you decide to drive across the north to the western Fjords and camp in the town of Holmavik. 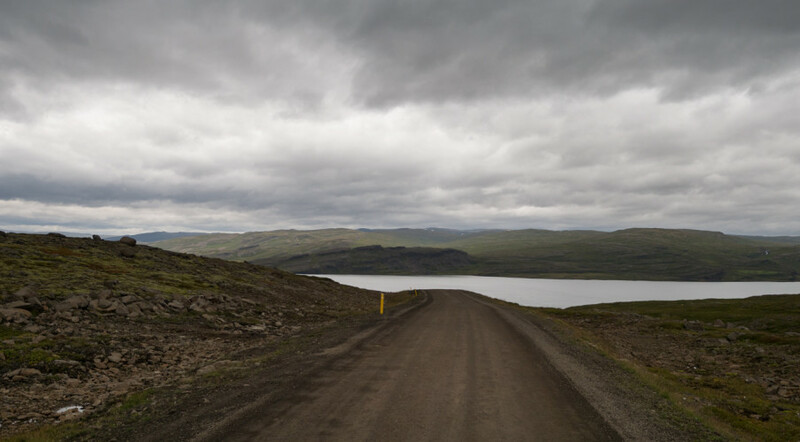 The distance between Akureyri and Holmavik is some 350km and after you leave the ring road behind and turn into road 61 and 68, some of which were just gravel roads, you start enjoying the beautiful scenery of the western fjords. 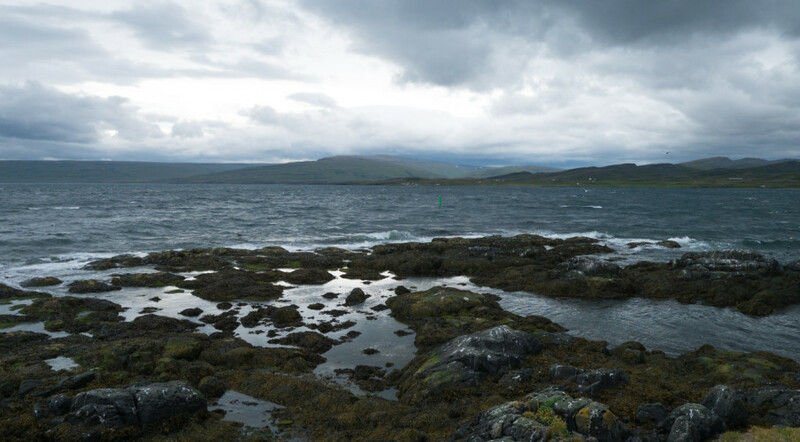 The land is immense and is constantly spilling into the fjords. 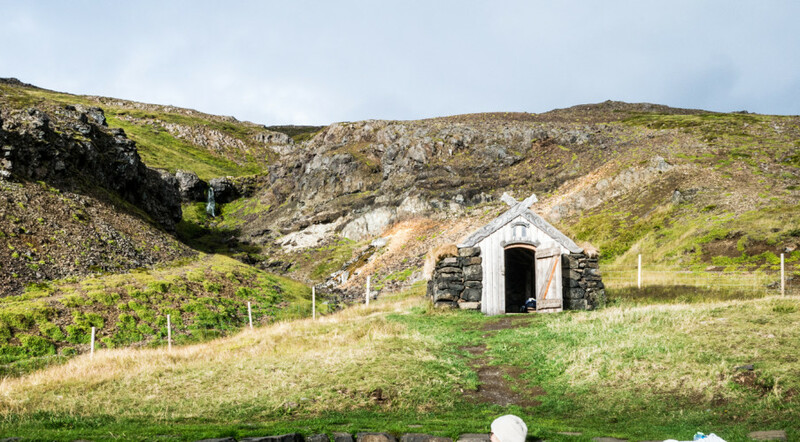 A few farm houses dot the coast line and the occasional church impresses a sense that this isolated community is indeed a community. 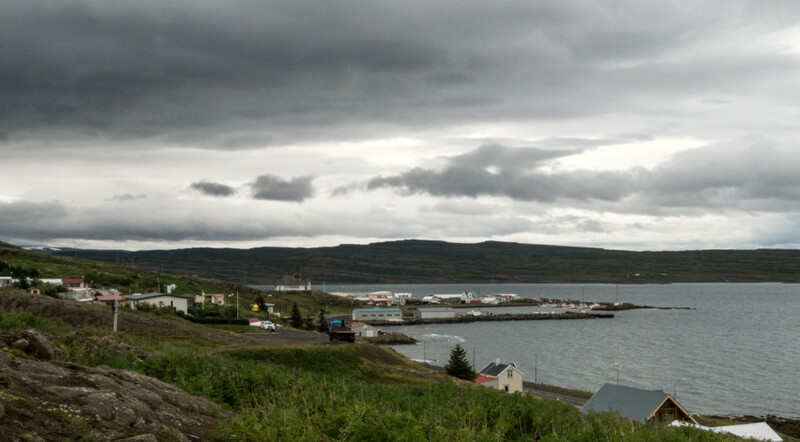 Here and there you spot tiny harbors one of which is your final destination of the day – the lovely town of Holmavik. By the time you arrive, you are exhausted and the peace in the Claus is at stake – you just drove over 400 kilometers and the only thing to do is to hit the hot-pot that just happens to be build into the community pool, that’s just happened to be 20 meters away from the camp ground where you and Claus are parked. You enjoy a dip in the three heated pools and observe some of the locals socialize. 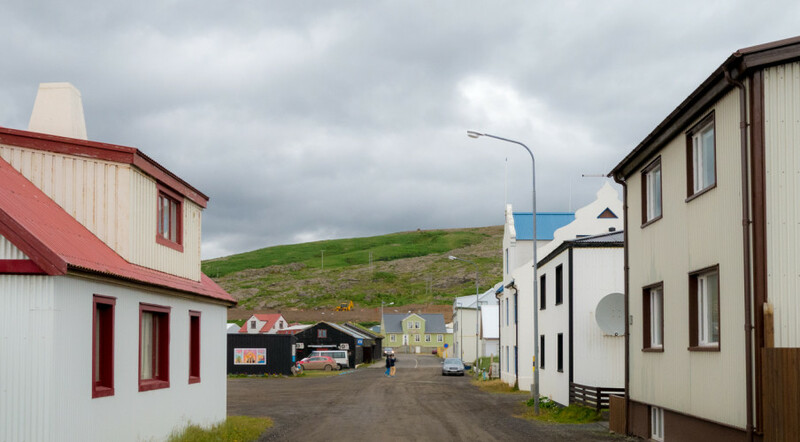 The hot-pots, practically available to every community, are really where it seems that Iceland’s citizens come together. Folks sit in the hot-pot, chat, change tubs (there seem to always be three different heat levels) together and leave around the same time. You leave the pool shortly before closing time and are too exhausted to eat anything more than a few crackers with cheese. Tuesday starts with coffee outside. Someone, even though by the time you arrive to the camp ground the previous night you were practically delirious, you managed to park right by one of the picnic tables in the grounds so breakfast and coffee is served outside. 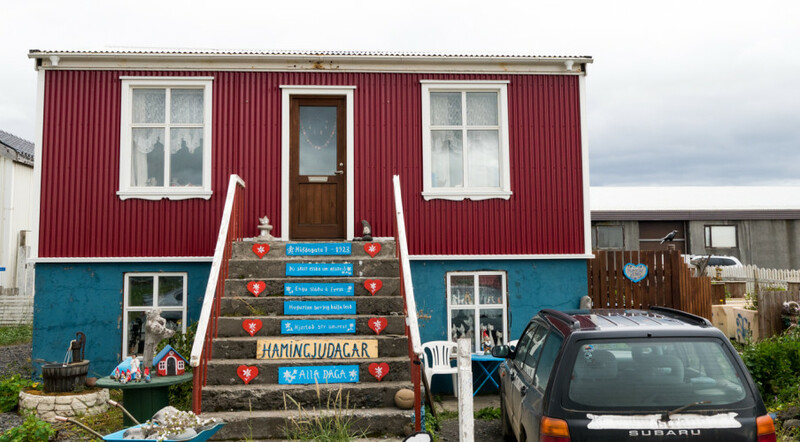 You then march into the center of the 15-houses community and explore the museum of Icelandic Sorcery and Witchcraft. You learn that in Iceland, almost no women were burned at the stake for being witches, but that men were the subject of prosecution. You also learn that there is a thing called Necropants, that’s actually on display at the museum and is pretty disturbing. After this little culture shock and a stroll through the harbor, you head to the next stop – a hot-pot that’s said to be on the side of the road and is free. And indeed, the guidebook did not lie. The three blue tubs are kissing the Atlantic and are also positioned about 2 meters from the only “road” (which services about 2 cars per hour). You hop in and spend a good hour before changing back and heading inland. The ride takes you on an F-road up the huge mountain that’s looming over the fjord. 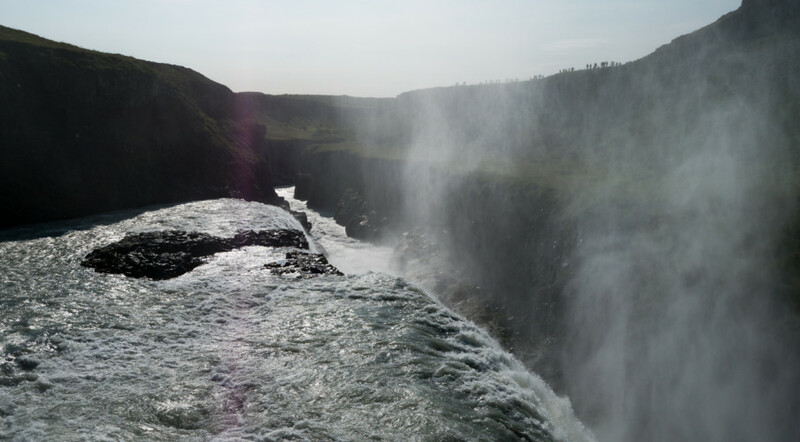 As you climb up you notice that the temperature drops significantly and the scene becomes bigger than life, covered in patches of snow as well as plenty of waterfalls. Cars are nowhere to be seen which suits you just fine as you can just stop everywhere and take pictures. The wind is harsh and the weather is kissing the freezing zone. 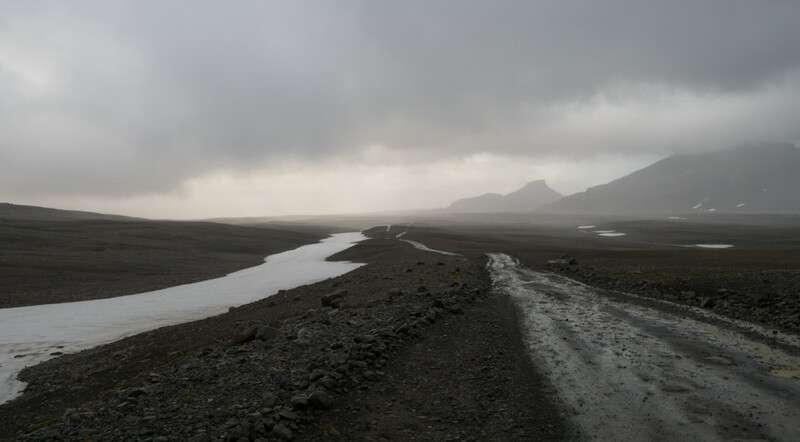 You are therefore pretty happy when you get to the paved road that leads to the legendary Laugar in Western Iceland. You camp here for the night, failing to find anywhere to pay for the stay, but finding the outdoors hotpot and a very windy camping area. 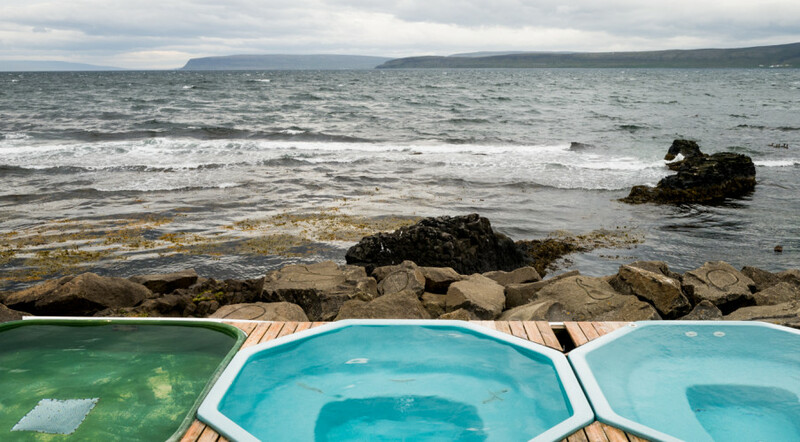 Laugar is deeply rooted in the nordic sagas and has a lovely outdoors hot-pot that’s just too inviting. So the lady spends her morning dipping while you trek up the mountain to get some exercise and photograph the waterfalls. By the time you leave you realize that Claus is the last vehicle in the camp ground. 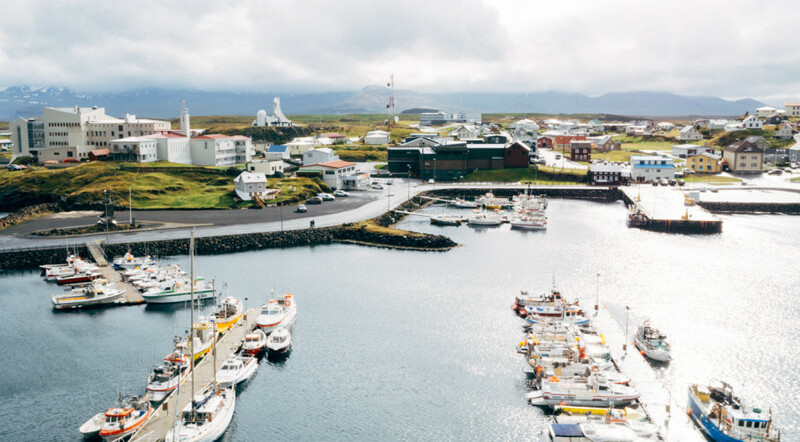 The next stop is further west along F-road 54, which runs parallel to the Hvammsfjord, destination: the lovely fisherman town of Stykkisholmur where Walter Mitty takes off in a helicopter! The town is indeed as lovely as the film makes it seem and lunch there turns out to be another great Icelandic meal. 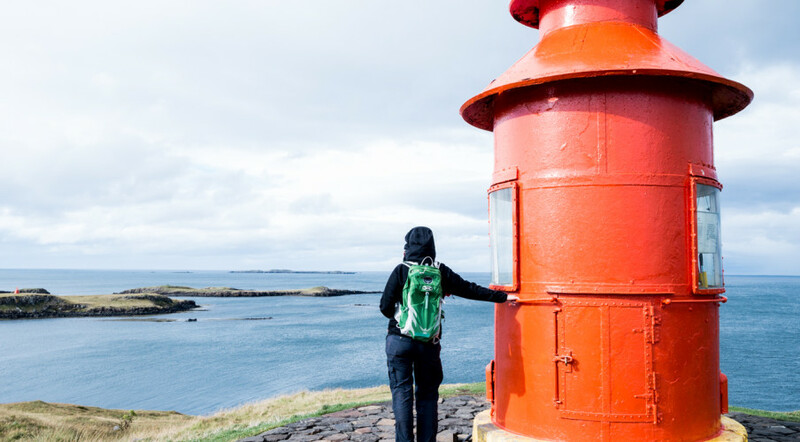 You then walk up to the orange lighthouse and enjoy the view of the fjord and the ocean before getting back to Claus and heading south. You cross the peninsula on the 56 which turn into the 54 and then go looking for a hot-pot in nature. The instructions you find on the Internet are somewhat vague and include basically a turn off, a distance, and the fact that one has to go through two gates. 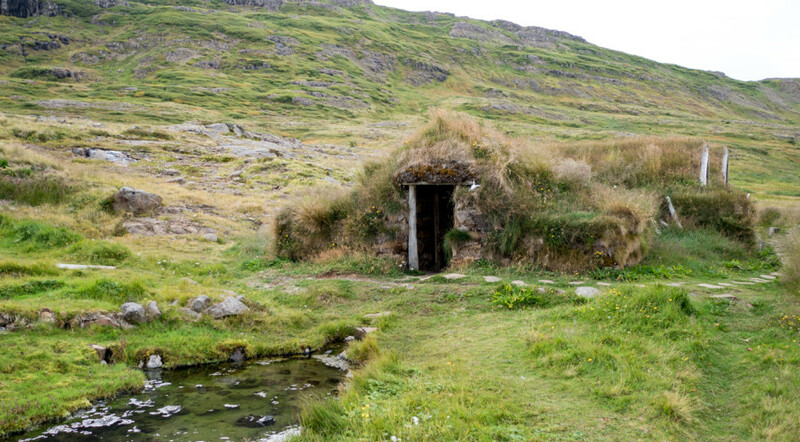 You find the first gate realizing that this is likely to be the gate to a property of a farmer living in this remote and obviously volcanic part of the world. You take your chances, drive through the property and cross the second gate. The road ends at what seems to be the slopes of a volcano and you go looking for the hot-pot on foot. After a few wrong turns you find the pool, submerged into the ground, clearly marked by a primitive step ladder leading into it. Your excitement is somewhat subdued when you see that the water is green with some algae and that another car is approaching. 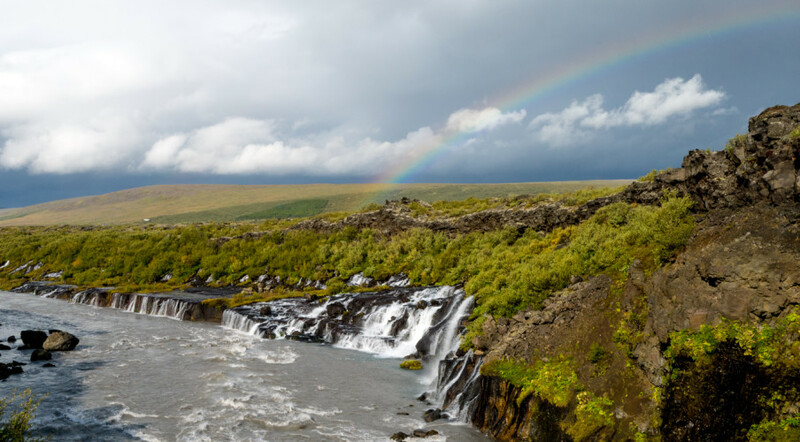 The second car, packed with a group of Belgians, is determined to experience this wonder of nature, but you decide that getting sick on the last days in Iceland might be ill-advised so you turned the Claus around and drive back out to the road. Your compensation comes in the form of Borgarnes public pool which includes, of course, three heated hot-pots and some water slides! A day that ends with hot-pots is always a better day, however, the camp ground does not seem appealing and after a quick consultation with the lonely planet guidebook you are on the way to a location some 15 km out of town. 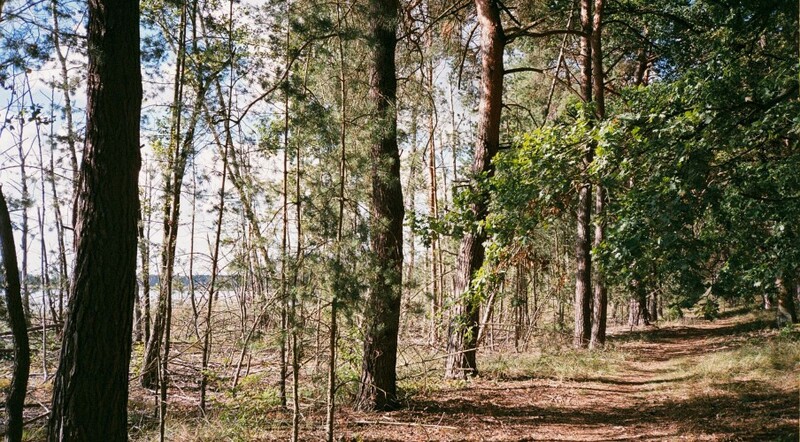 You arrive in darkness and are told that the camp ground does not exist anymore, but that another camp ground exist some 10 kilometers up the road. 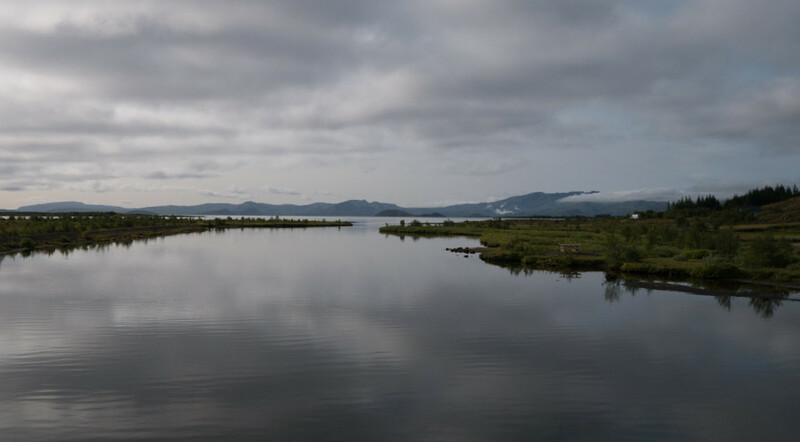 You continue the drive and find a very nice looking camp ground, with heated bathrooms no less and one small hiccup – there are no other folks in the area, no campers and no obvious owner. You take the joint decision to drive back to Borgarnes and sleep there. Sleeping alone, without any other travelers in sight seems too risky in a land that hosts trolls and Necropants. And on the last day? More waterfalls and a long drive through an F-road crossing a huge mountain range at close to zero degrees weather brings you back to where you started. You descend into Þingvellir from the North leaving the gravel road behind and returning to civilization. You drive into Reykjavik in the early hours of the afternoon and meet the owner of the Cozy Camper who collects Claus and is happy to hear that you enjoyed the adventure so much. The adventure is one for the books and you both admit that this one, with its nature, hot-pots and freedom, will be hard to beat. But you’re going to have to try. 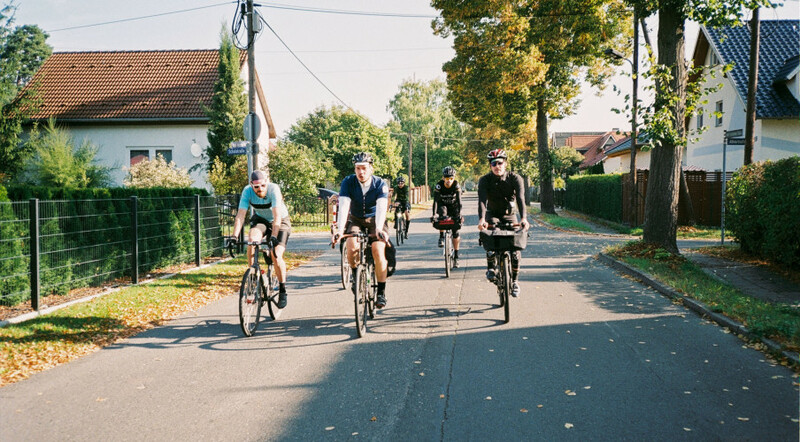 Every year since 2010, Rapha, together with Strava, challenge the world of connected cyclists: ride 500km between Christmas Eve and New Year Eve. 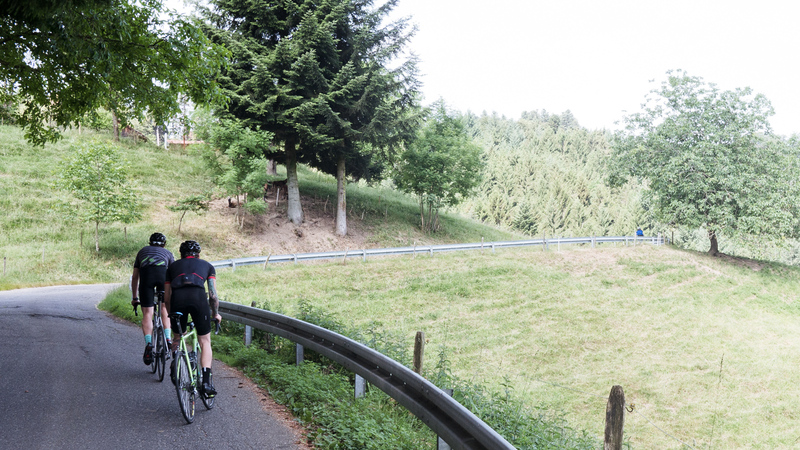 As both companies are firmly based in the Northern Hemisphere it is clear what the challenge is all about: get out and ride exactly when family obligations and bad weather are crowding your usual cycling style. I’m sure that generations of psychologists could study the effect of the challenge on the health of family life and the increase in family pressure on the non-cycling partner. My non-cycling partner understands very well the need to first and foremost escape Christmas, get some riding and avoid bad weather in as much as possible. So when I propose to spend Christmas to New Year (and then some) in a land not far from Europe, but with general hospital weather during this time of the year, said non-cycling partner (it’s a transient state that will change come spring) approved the plan and decided to join after the Christmas hoopla is completed. As the 24th was approaching, and final checks on the general health and readiness of my well traveled Hunter (now with overwholed fork thanks for the Rick himself) were completed, I got excited. Friends back in Europe were preparing to ride in god-awful weather (snow! rain! sub-zero temperatures!) and I was facing blue sky, 22 degrees (Celsius) and was planning on wearing a summer kit. I felt that this may be cheating, but since quiet a few folks in Australia signed up for the challenge I decided that it was somewhat acceptable – Christmas and New Year happen on the same day even when the weather is nice. Given plans and family obligations, ironically all happening post-Christmas (well…not so ironic for a family that does not celebrate Christmas), I also decided or rather was compelled to finish the challenge in 4 days. The biggest challenge for any riding in Israel is actually the fact that the country is tiny and is entirely constructed to satisfy mountain bikers (and cars) and ignore road riders. I actually knew that before arrival and was planning on abusing some of the many off-road tracks that cross the country, but these turned into lakes of mud due to a few days of heavy rains. I attempted to ride one of these paths prior to December 24, but after 15 km that took about an hour and created a layer of mud so thick around my tires, I decided to abandon the plan and stick to the roads. Here again Strava and the tiny road-riders community of Israel (at least from Strava it seemed that way) came to the rescue. I checked out a few routes and was shocked to discover that they all took major highways. It became clear that there are no other options. One have to ride on the side of the highway, on the shoulder if you will. The good news was that the shoulders were very wide. The bad news was that you still had to ride on the highways. I decided to throw all caution to the wind and brave it. I was also following two friends from Salzburg who were riding and documenting their much less sunny attempts to complete the challenge. Their blog was a source of inspiration and a certain glee. Day one took me from Tel Aviv to the north Arab village of Fureidis. There, after 80 km of riding, and quiet a few bad navigation mistakes, I sat down at a local restaurant and ordered hummus, falafel, french fries and a whole jug of lemonade. The hummus was amazing as were the falafels and fries. If every ride in Germany had that for an incentive, I may even be riding more. I then continues north for another 10 km before turning around to ride along highway 2 which took me along the sea back to Tel Aviv. Day two was Christmas day which was a good enough reason to head towards Jerusalem and do some climbing. 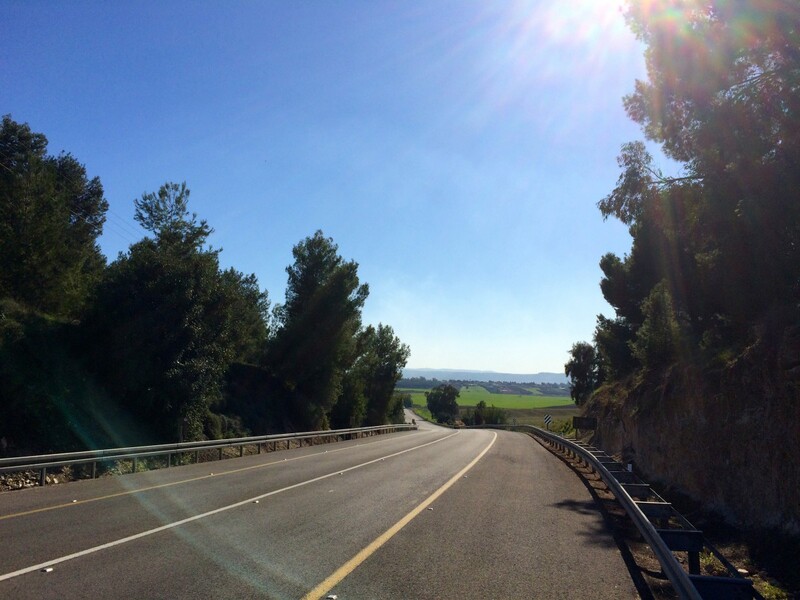 As I was riding up the mountains that precede Jerusalem, I was thinking that climbing is a pretty silly way to collect any distance, but the scenery around me was so breathtaking that I quickly stopped this line of thinking, continued sweating and going up. 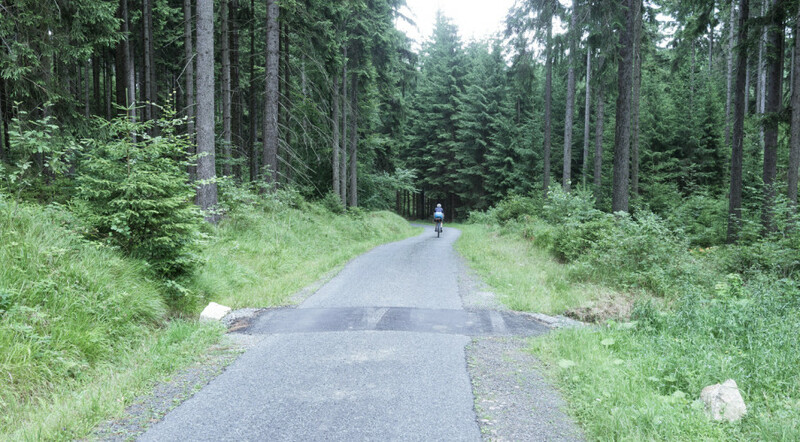 I was riding in a hilly area, full of pine trees and small valleys. 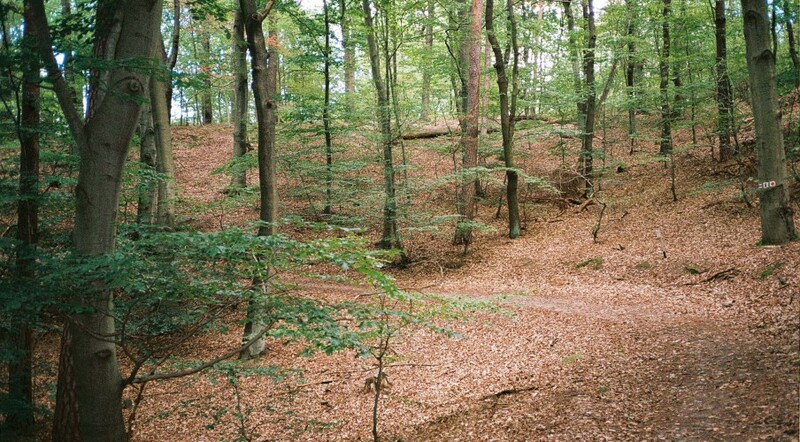 It seemed that every piece of land was used by farmers and the rest were low-forests with signs indicating that here and there various biblical-events took place. I got up to a park called “U.S.A. National Park” and there, with climbing reaching silliness level, I decided to turn around and head back towards the beach. This was also the only route during the 4 days adventures where I actually saw other cyclists. Day three was split into pre-family meal and post family meal. I finally realized what it must have been like for my cycling friends who stayed home with their family trying to negotiate rides between lunch with this uncle and dinner with that Aunt. In my morning ride I circled Tel Aviv, rode by the airport and then came back into the city from the south. It was amazing to see that a loop of a few hours, practically covered the whole center of the country. After a huge meal celebrating an uncle’s 70th birthday, I took off, full of guilt at the amount of food that was consumed, towards the north east and then, strategically I might add, rode back along the sea and caught a most excellent sunset in a cloud free sea that merged seamlessly with the sky. I did already make a deal with myself for 2015 – stay at home and ride in the cold. Bring it on! 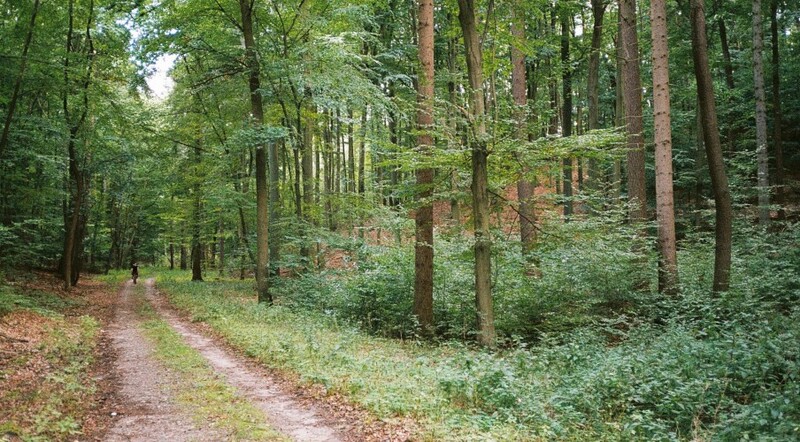 Radventures in Saxony or Sächsischeradenteuer. German is an awesome language: you can make as many new nouns as you will by compounding nouns and names together. The above noun is made out of the name of the area (Saxony), Rad which means wheel and also, in Californian, radical, and Abenteuer which is adventure, in German. So there you have it. Three days in the wild side of the deep east came and went, but the level of excitement and stokeness remains. 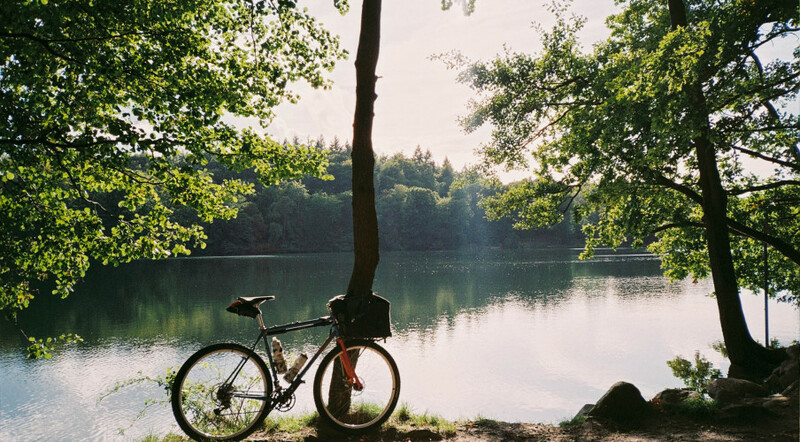 It all started with Neil of Cedar Cycling announcing his intention to visit Berlin and to go on a bike tour. Neil also reminded me that he has been choosing motorcycle over his beautiful Kelly Bedford which meant that my need for distance had to be curtailed. 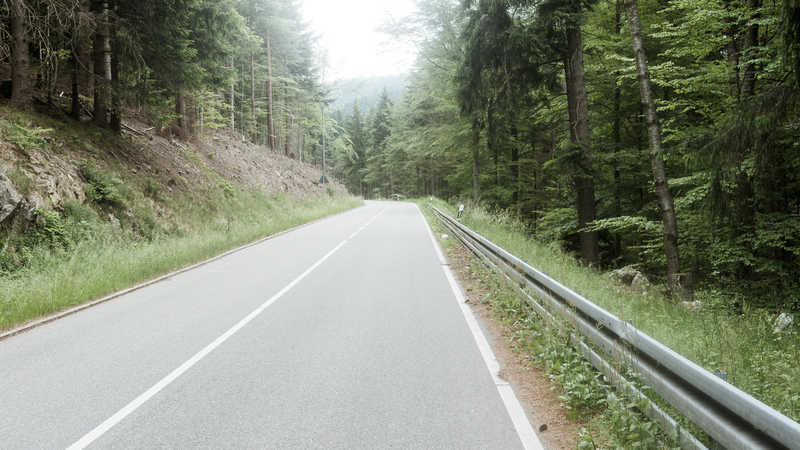 I planned a 550 km tour along the border with the Czech Republic from Dresden to a city in Bavaria called Passau which I figured we could easily accomplish in 4.5 days of riding. We had no hotel bookings, no real daily targets and a very small amount of gear with us. 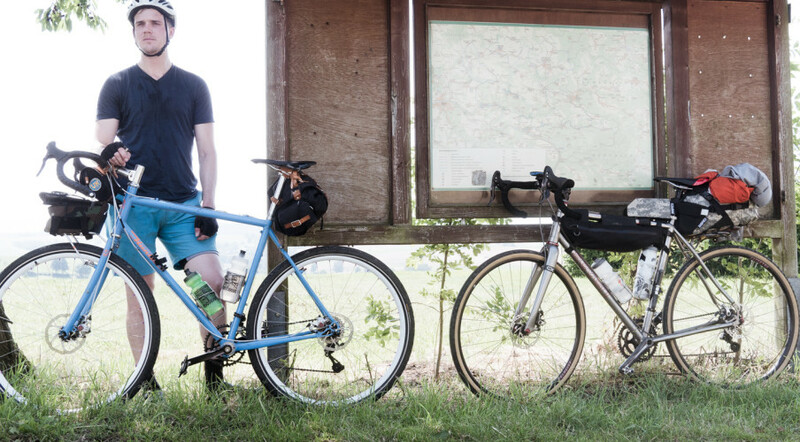 We called this hobo-touring as we limited our gear to whatever could be inserted into a Revelate half-frame bag, a seat bag, and jersey pockets. The train from Berlin to Dresden takes a total of 2 hours. 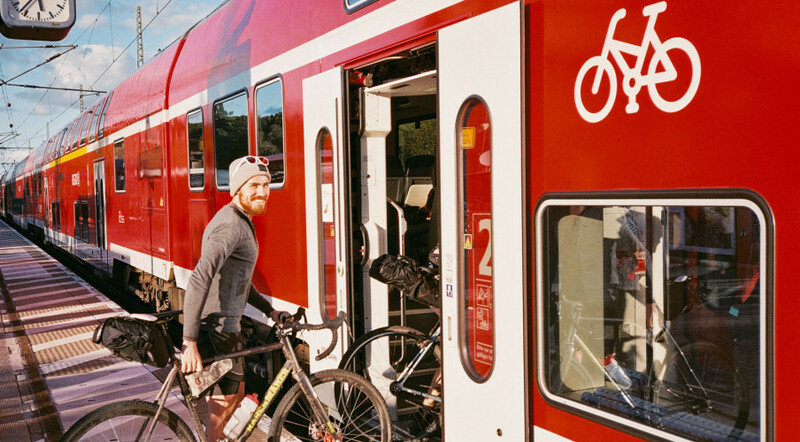 If you get the right train you can take your bike with you without needing to box it up (the difference between using the ICE and the IC trains – the E stands for express). 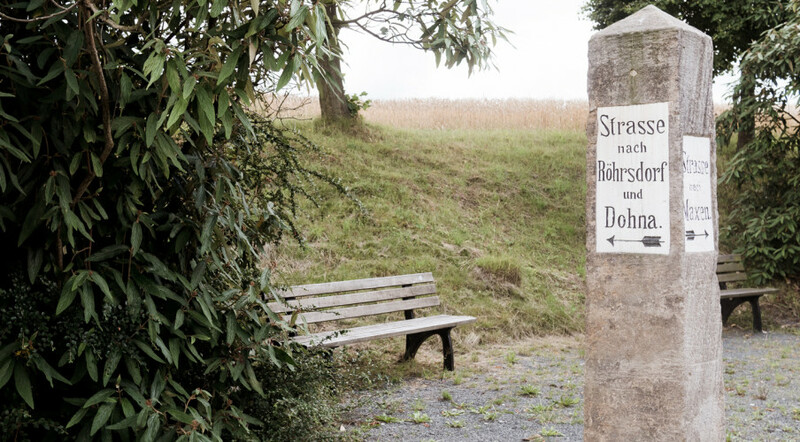 We got out of the train station in Dresden and headed to the first part of the tour – an old German post road which I discovered while trolling around Wikipedia for routes of historical significance. This was roughly the only part of the tour which followed any sort of plans. 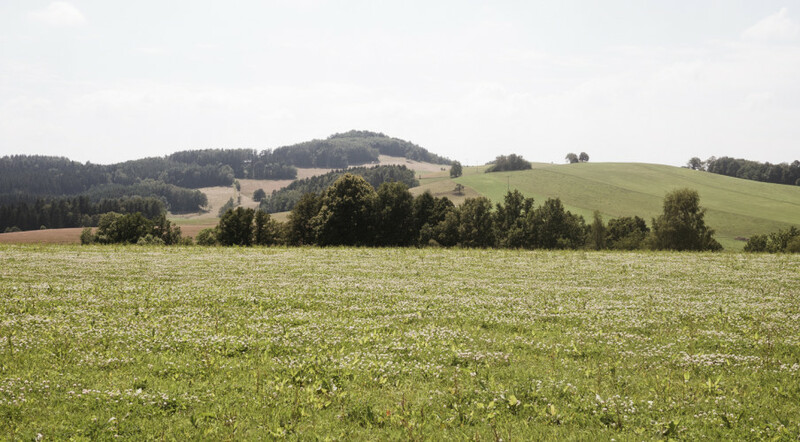 We were out of the city and quickly into the hills surrounding Dresden in a matter of 30 minutes and from there the environment changed quickly to rural farmland with narrow roads and many hills. We tried to stick to the post road as much as we could, but probably did not adhere to the route too religiously. There were simply too many interesting things to see and as soon as the environment changed to lush green we stopped caring about the destination and enjoyed the scene, stopped to take pictures and when possible get some coffee or ice cream. It was hot and somewhat humid so finding water sources was also high on the agenda as well as sparing Neil’s legs for the rest of the tour. 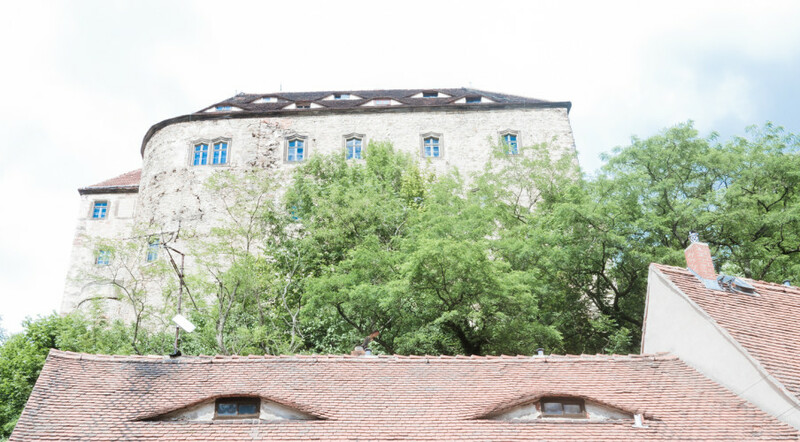 We did notice, when riding through some of the little towns, that the houses that looked the oldest had windows that looked creepishly like eyes. One of these houses even stood outside of an impressive looking castle and looked more menacing then the actual castle that was towering over it. This little village was also when we decided to head into a village that appeared, at least on the map, to sit on the edge of a large lake. We constantly were in a state of not knowing how far the next target was, but Garmin actually was pretty good at telling the distance once we figured out where we were heading. By the time we made it to Bad Gottleube it was already 17:00. We sat down for a coffee and decided to check out the Bed and Breakfast in the tiny town. They had a two-room, joined shower, combo which was going to cost each of us 30 Euro for the night with breakfast and Internet – we decided that this was the correct place to park ourselves. We took the keys to the rooms and decided to ride up to the top of Augustusberg which towered at 507 meters (1663 feet) above the village. We figured that there would be a hotel there with a terrace and a dinner menu and indeed we were not disappointed. It became clear that the tour is not destination driven, but rather sights oriented. 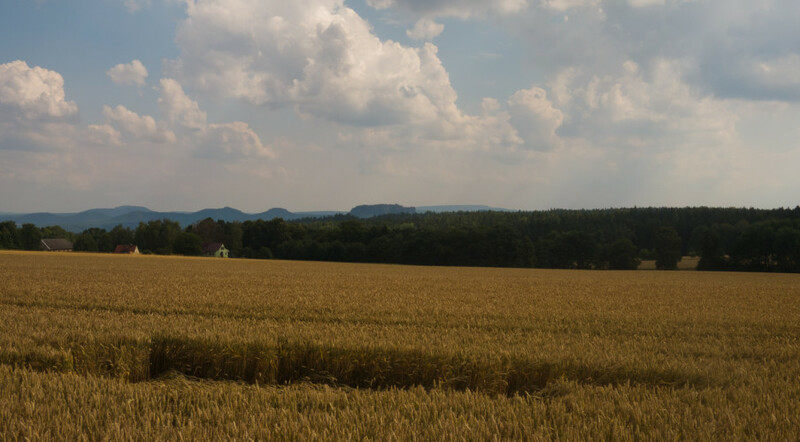 So the next day, having found a local map that showed the sights, we circled some targets and decided to head out towards the very east corner of Saxony and catch as many of the attractions as we could. The area is called “Saxony-Switerland” and not for nothing. 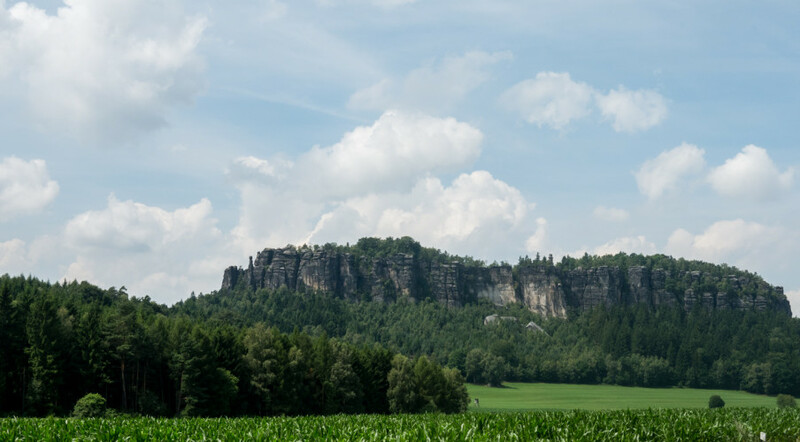 With the Elbe river running deep between strange geological structures, plenty of rainfall and sparse population, we felt as if we were touring a far away land. As the second day progressed and the realization that we are not headed to our original target cemented itself, I felt more relaxed and was able to enjoy the sights. 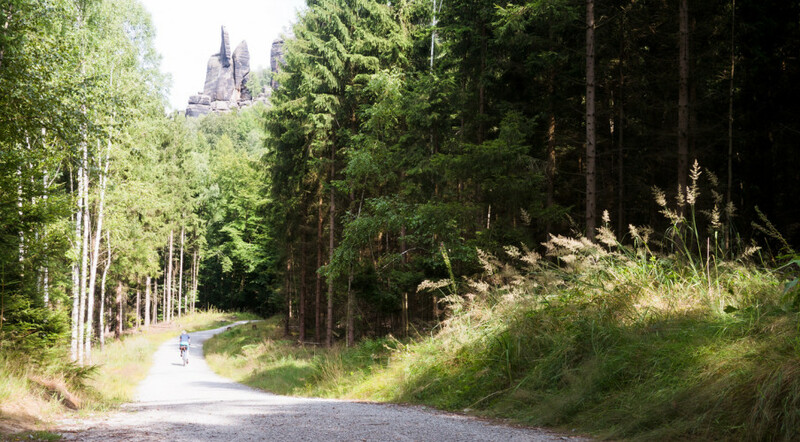 Both Neil and myself stopped on our tracks when we finished a climb, turned a curve in the road, and saw the majestic and incredibly weird Königstein fortress. This was really the moment where we sat down on a bench, took the incredible view in and were excited. We also discovered 4 leftover homemade pickles we picked up at a tiny village supermarket (they came in plastic bags and were homemade) and snacked in full view of the fortress. 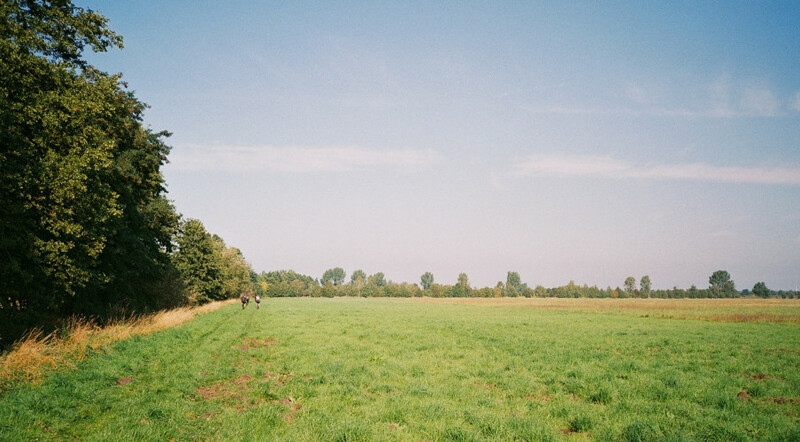 Pictures were taken and the ride continued in a northern direction towards the river Elbe. 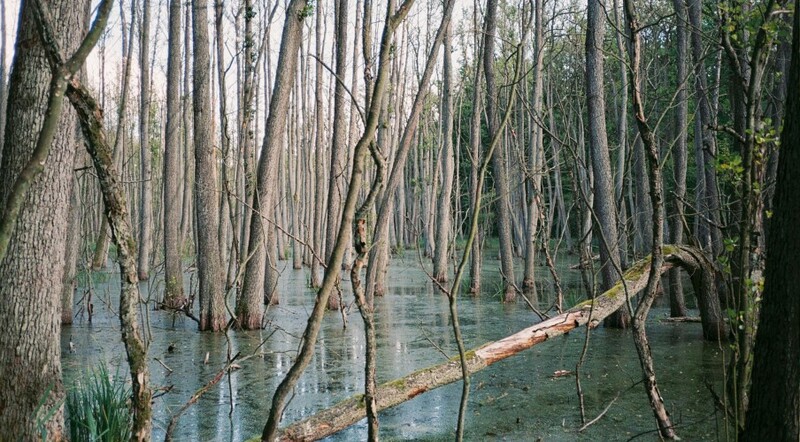 We followed the river for a short while, took a ferry across and disappeared into the forest again. I had an idea of where we were heading, but no idea on the actual route to get there. At some point the bike path split into gravel and road and we made the natural decision to follow the gravel path, which quickly turned into a forest path. 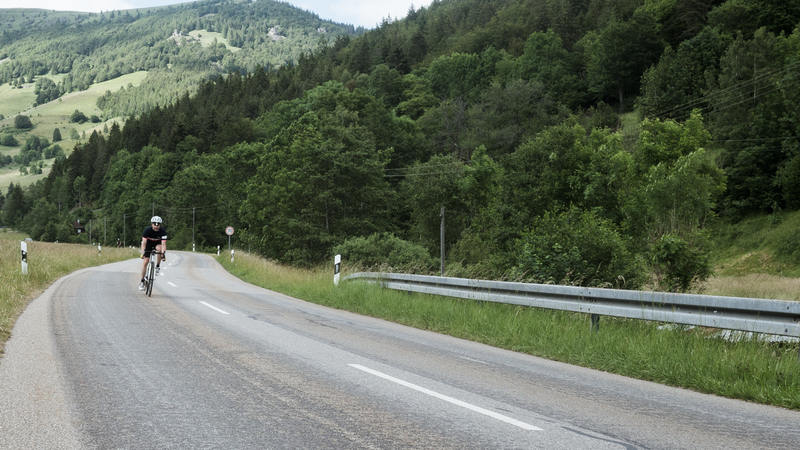 Garmin protested and insisted on making a U-Turn, but we ignored. To my amusement, if we ignored Garmin long enough, it eventually decided to take us on the best and least explored roads through the forests. 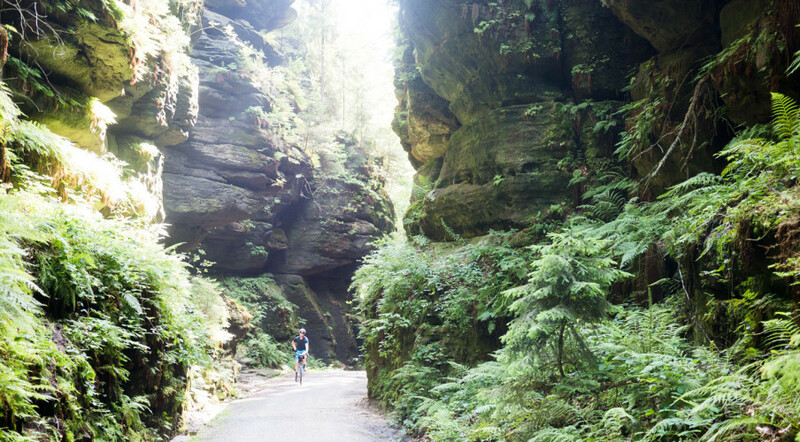 This occasion, where we accidentally ended up in the National Forest of Saxony-Switzerland, was so packed with surprises, that we tried the trick as often as possible. 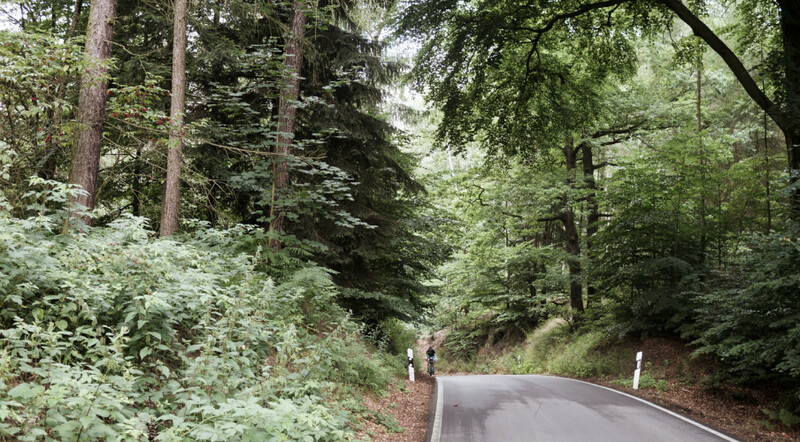 As we were rolling at a good speed in the forest, we took another corner and we both pulled on our brakes at the same time. 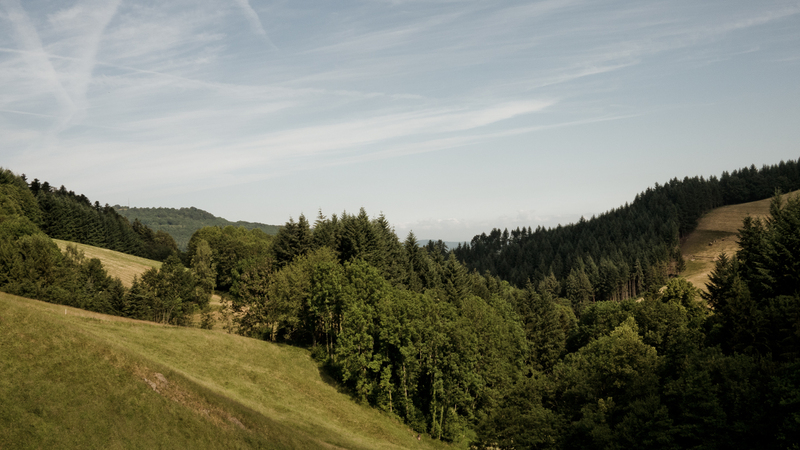 In the distance we saw a collection of huge rocks that appeared to have sprouted from the forest. We rode closer and I went exploring while Neil explored the forest. The stones were at least 2-300 meters tall and appeared to just be stuck in place in the middle of the forest. They all bore exotic names like Goldstein (Gold stone), Affesteine (Monkeys stones) etc. I was amazed that we even got to where we are since it was certainly unplanned and not clearly shown on the map we now had. Not only did the landscape looked wild we also had amazing descends in the forest and eventually arrived to the end of the forest. Right before leaving the forest, Neil, who was riding my Adventure-touring Hunter broke the rear-deraileur cable. We tried to bring it back into functioning mode for a while, but miserably failed. 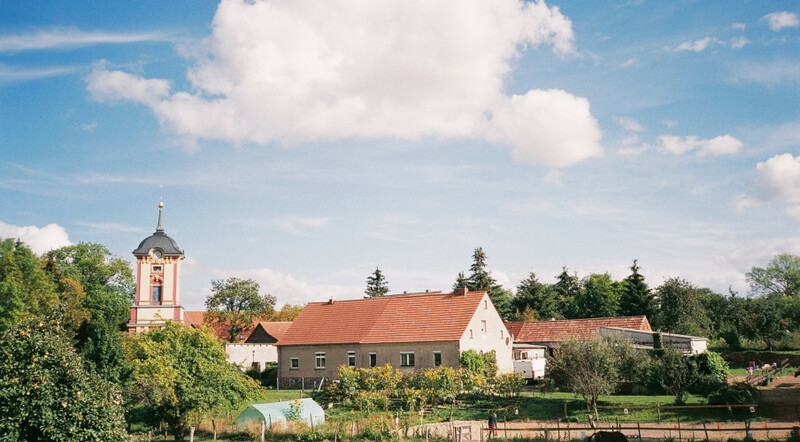 Instead we swapped shoes and I rode Hunter, as a single speed bike locked on 22 teeth in the front and 12 on the back, while Neil took my Seven Mudxium S. We made it into a tiny village called Hinterhermsdorf which looked like it was the east most point on the map and found a small hotel to stay. 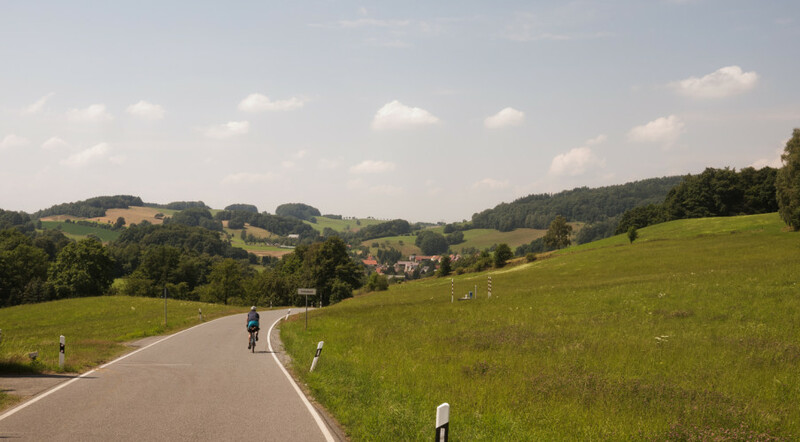 The third day started with a single speed ride to Sebnitz, a town slightly to the north west of our hotel, where we found Egert, a bike mechanic, that could fix the cable. 7.5 Euro and 30 minutes later we were ready to hit the road again. 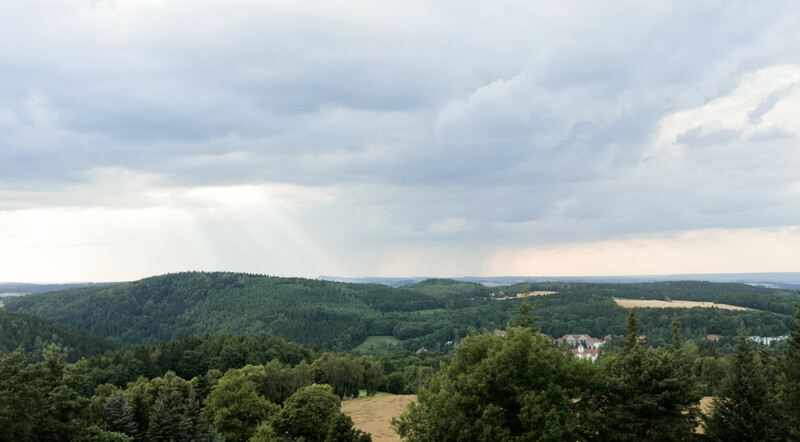 This time we wanted to head west towards a mountain-top fortress called Hohnstein and then ride down to the Elbe before heading back to Dresden to jump the train back to Berlin. We climbed and climbed and again decided to take the other roads than the ones Garmin originally planned for us. This time each of the decisions were more and more rad. Ways that somehow existed in the Garmin map but clearly were not used in years and years. We did not care, in fact we were grateful to find all these routes and pretty much just looked for more all the time. 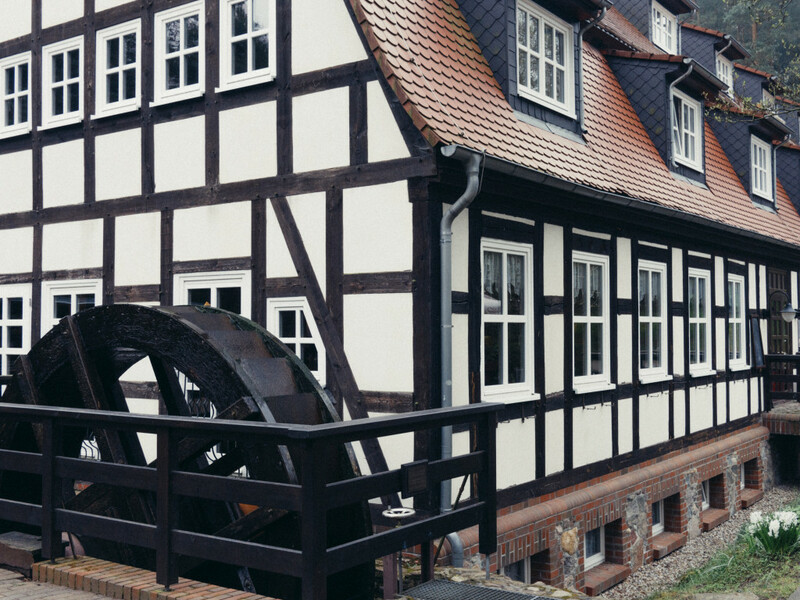 We had sections that were covered in clay-like stones and sections that were clearly formed by river run-offs and ones that probably last saw any wheels when Germany was still split into two countries. The last section was probably the most exciting and challenging and included many boulders. While I managed to hop around most, one boulder did manage to jump at me at the end and succeeded in taking a huge bite out of my front rim. This was the end of the getting rad fun. I could hear the rim deform and could see the spoke loosen. While I could still ride, with a very wobbly front wheel, we knew that we could not put a lot of distance on the wheel. The loose spoke started banging on the TRP Spyre caliper, but lasted nicely until we got back to the Elbe river, took the train back to Dresden and then got on the train to Berlin. Distance-wise this was a day’s riding. But as Neil correctly pointed out, we had all our stuff with us, we moved from one point to the next, we had no idea where we’re sleeping the next night and we got to discover an incredible landscape that’s only 2 hours train ride from home. I consider the tour amazing as well as a preparatory tour for the next adventure in Saxon. Great things are coming and they’re closer than you think. Contrary to popular believe, Germany is a rather large European country. Getting from the North-East to the very opposite corner is a time consuming adventure even when officially the roads do not actually have a speed limits. 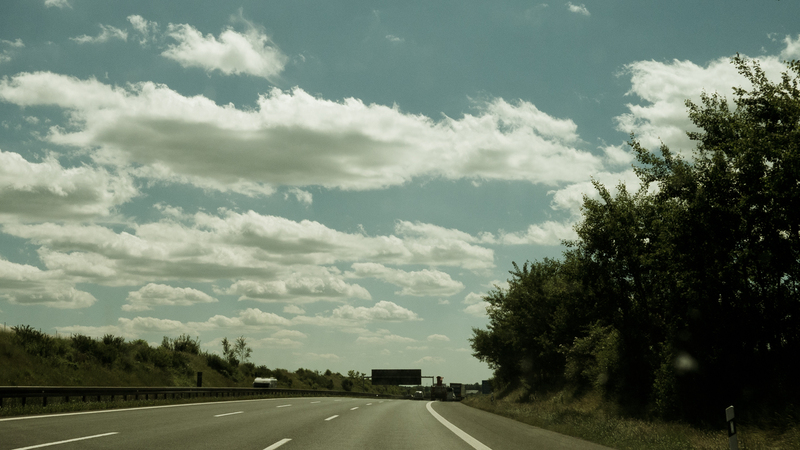 Yes, our famous Autobahns are constantly under constructions and, as a small group of us learned on a recent Friday drive, rather full of other cars. 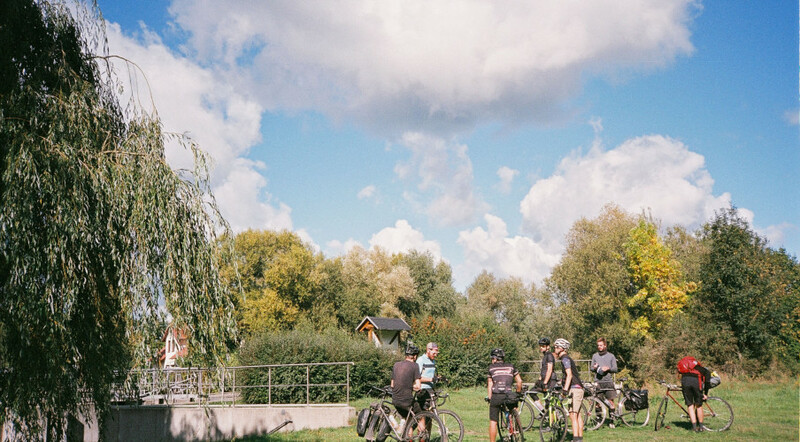 We packed our bikes into a white “Ugly Duck” rental, adjusted the bags, which had to be placed between us all, and took off to Freiburg – the other side of Germany. 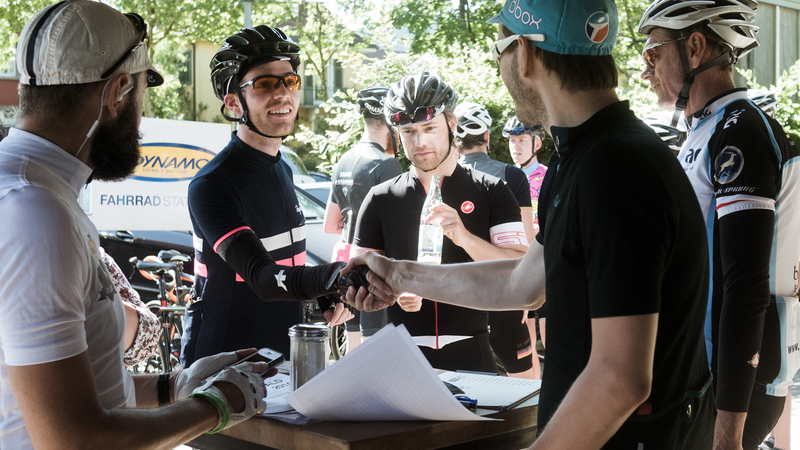 For three years running, a small crew of road riders organizes a ride in Schwarzwald (Schwarz = black, wald = forest) called the Schwarzwald Giro. This year I decided to join the ride at the encouragement of Jon Woodroof of twotoneatl.com. 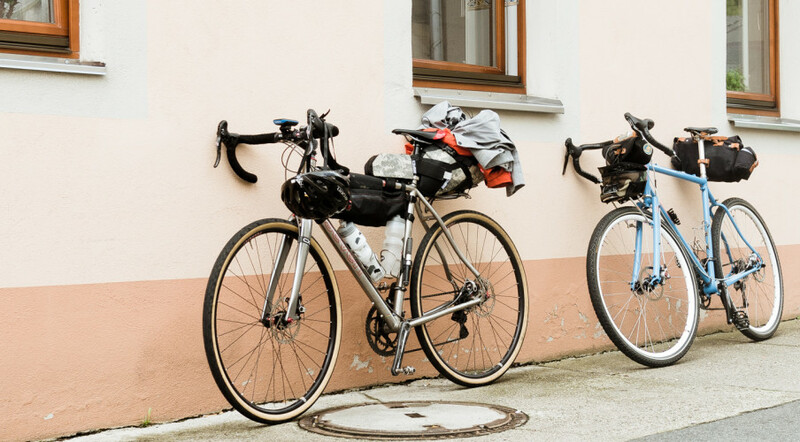 I was elated to hear that 5 other riders from Berlin were joining the adventure which is how I ended up in a rental with three of them heading south. We arrived on Friday night after some 9 hours of driving. The hostel was in top form and we decided, after buying some provisions, to find a local eatery and rejoice in the local cuisine – Spätzle and beer. The air was fresh and much clearer than Berlin, and the restaurant in which we sat was practically at the edge of a towering mountain covered in massive trees. 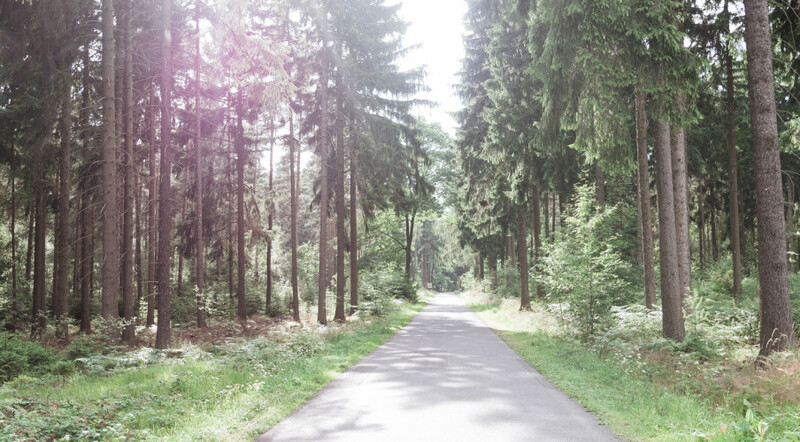 Welcome to the black forest. Saturday started with a warm up-ride, planned by Florian of Troica Cycles, which took us up one of the smaller mountains – 1300 meters high and back down. For me this was the substantiation of my fear – the ascents are nasty. I climbed at my own pace which was substantially slower than the rest of the crew and found my own way back to the hostel for a quick bite before the prolog began. This was a reoccurring theme. At 13:00 we all met at Biosk with the rest of the riders and took off. The 57 kilometers took us through breath taking views slowly up an 800 meters mountain and then through fast drops back up to another mountain of 1000 meters. All together we rode for 57 kilometer and on my Garmin I clocked 3 hours. The rest of the crew was already comfortably sipping beer by the time I arrived to the GPS track’s end. 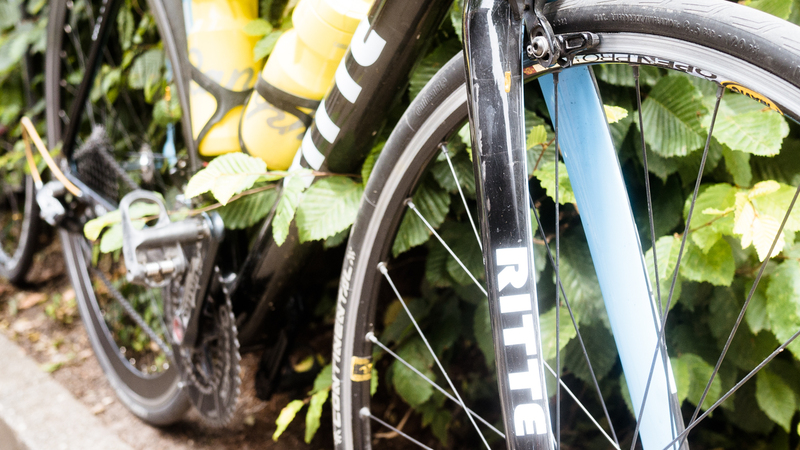 During the first descent I realized that the TRP Spyre brakes were getting very hot and were loosing breaking power. This, when gunning down a serious mountain, is a rather scary concept especially since these brakes are the ones that should be ideal for such downhill rides. I tried to modulate less and decisively brake when getting to a speed that exceeded my comfort zone – 60 km/h seemed fast enough. The view of the first day were a little tease to what appeared on the actual Giro. 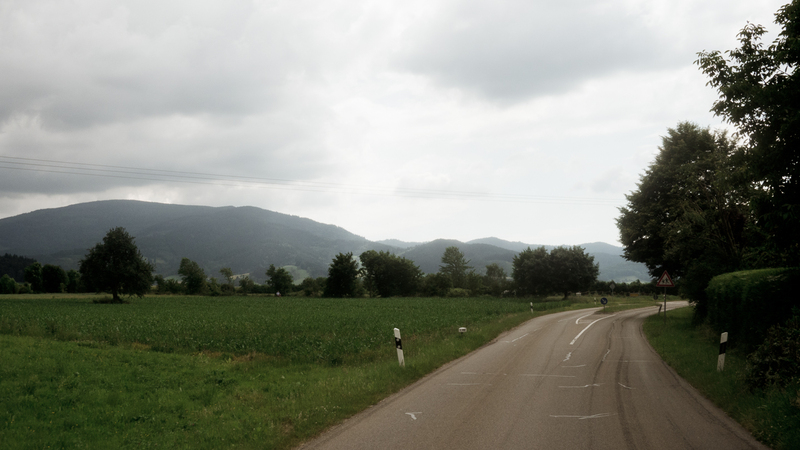 We kicked off with the Freiburg team at 10AM with a 30 km ride to the actual start of the Schwarzwald Giro. There we met with the second team that started at Basel, Switzerland. As soon as we left the meeting point we started climbing and just as fast I found myself alone climbing at a pace that I could actually maintain. Reaching the top I encountered a few of the fellow riders one of which waiting on his mate which had wheel issues and the other that was ready to quit. I suggested that instead of quitting, we will join forces and ride together and he accepted. After a quick water refill we hit the road again, this time heading down. The lush green meadows spread anywhere we could see and were only interrupted by cows or goats or, as one would expect, by the actual forest. The descent was beautiful and then the yellow sign on the road directed us to smaller road that disappeared into the forest. As soon as we took that turn the road started climbing again, this time at a much steeper grade of what I suspected was 20%, but what do I know? 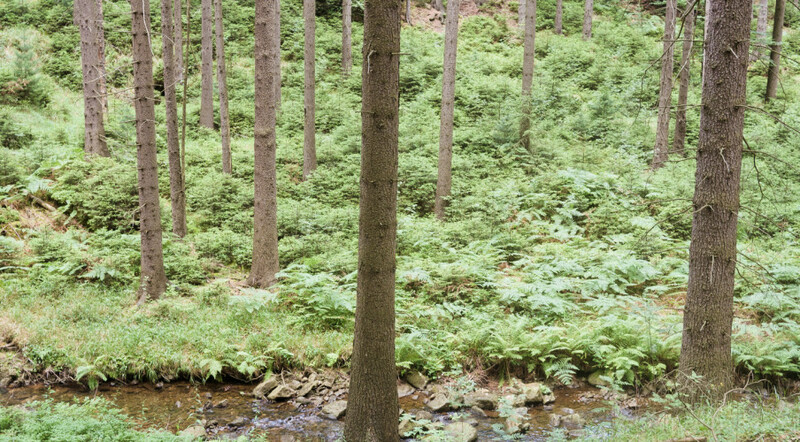 Everywhere I looked were ferns and trees and deep creeks. Birds were singing and all kind of flying insects, some of which flies but some unidentified, were buzzing around. I was pouring sweat like a waterfall, but was determined to continue climbing until, after what seemed like a long time, I made it to the top. The way down was spectacular and fast. This was supposed to be the second and last climb but truth in advertising is rare and even though technically the Giro had no more climbs, the way home did. 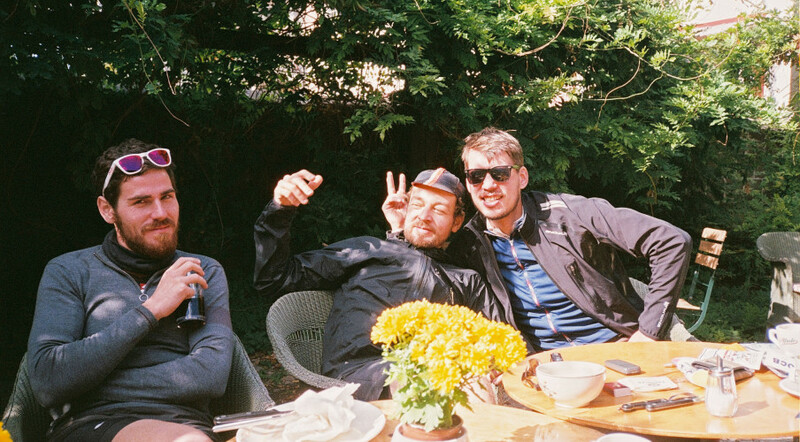 I found the rest of the team well rested at a coffee break that Philipp organized drinking espressos and munching on vegan cakes. An apple and soft drink later we were back on the road which took us to a tiny gravel section. Gravel and road bikes is a funny concept and for the first time since both rides started I was pleased at having my Jack Browns 33.33 mm tires on the Seven Mudxium. 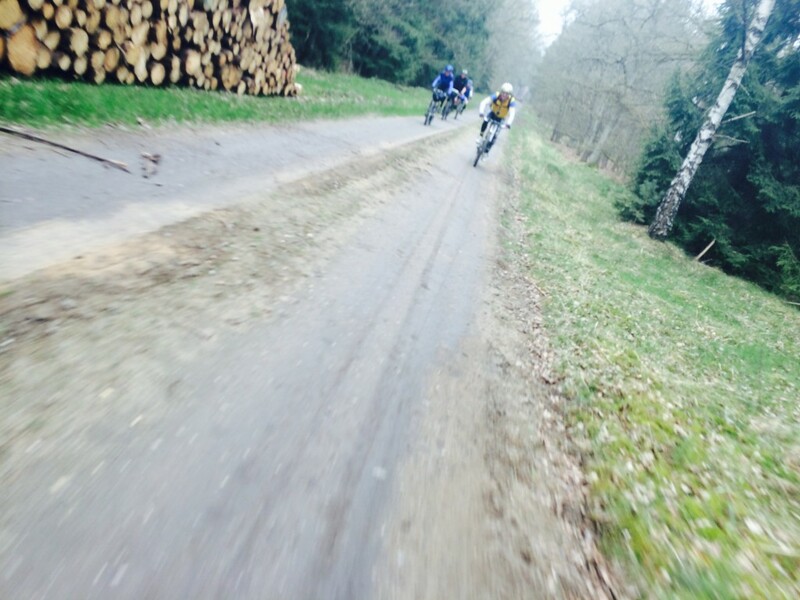 They ate the gravel like starving wolves while the rest of the riders were getting flat tires all over the place. As we returned to the road, I thought that it might be a good idea to continue riding instead of waiting for the rest to fix their tires and snap pictures at what seemed to be the end of the GPS track. With bad conscious I continued riding towards another climb. I pulled as hard as I could and made it to the top and then dropped to the other end and into a less then spectacular finish – no one was there. 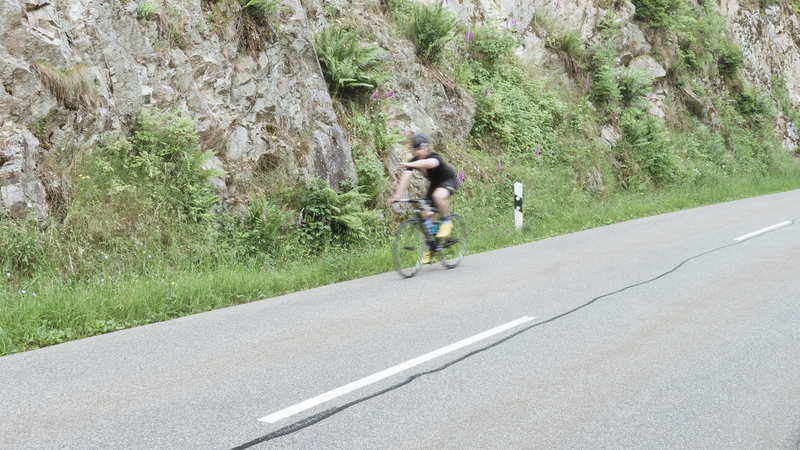 I took the opportunity to photograph the rest of the team, whose frames I mostly saw from the back since we arrived to Freiburg, as they arrived at the end point, and Kevin Sparrow, identifying me crouching on the side of the road, gave a proper victory salute. From the end of the Giro we still had to ride back to Freiburg which added 40 km of riding or so, especially since, yet again, we ended up riding in a small group of three without actually knowing the way back. We were lucky enough to hear Philipp say something like “at the end of the next climb you should drop to a deep valley, which we did, and enjoyed probably one of the sickest downhill I’ve ever experienced. The road was way steeper than the previous descends and, as I accidentally found out, had actual cars coming up the mountain. Sorry BMW driver for giving you such a scare. The whole organization, location, GPS tracks and company were fantastic. Philipp did a tremendous job taking care of us all and even dispatched Rune, of strongest riders, to ride down the last mountain and check on my state. 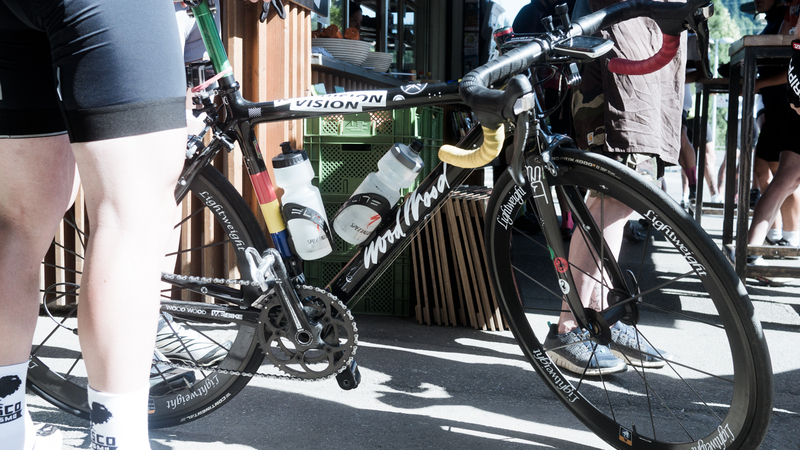 This was an incredible adventure with a definite take home message: ride even more. At the next Schwarzwald Giro it’d be nice to take pictures of the riders. More reports are found on the Good Times Roll blog and on The Radavist here and here. I’m going to regret this later, but what the hell, I’m in. Registration just opened today and promises a ride together! 2,000 meters of climbs, maybe some dirt, and a plan B is the weather is awful. 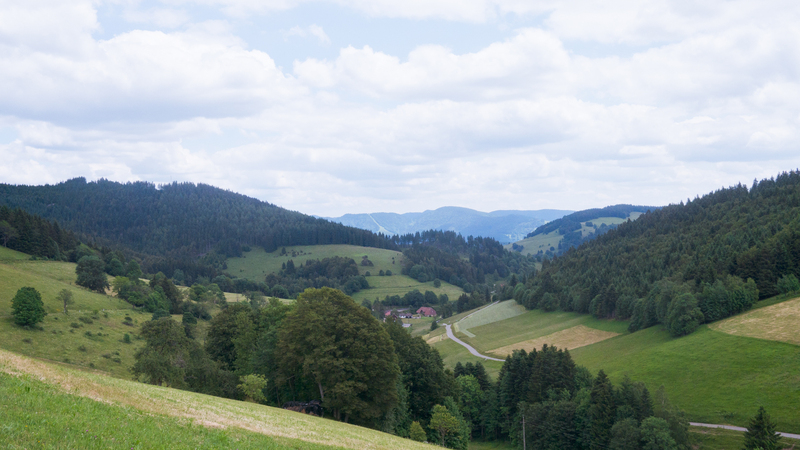 I have not been to the Black Forest since 1984 so it’s time. Anything sounds cooler when you put Der in front of it. The third day started rather early as to leave enough time for a big breakfast, bike check, loads of stretching and general checkup on the pains accumulated over the last few days. Bike and rider checked ok and breakfast was fantastic. We spoke about leaving earlier the night before, but somehow the message did not trickle down to every member of the group so we lingered and chatted until the rest were ready. A few minutes before 9:00 we took off. The first part of the ride was actually backtracking on the hills of the night before. That part of course was new to Karsten, Sven and myself since we took the road. Having ridden that sandy descent during the morning light I thanked every god in the atheist handbook for the smart move of the previous night. It was not fun during the day and was probably a hell of a lot less fun at night, especially without lights. Mental note: get lights. The fields through which we rode were covered in morning mist and looked dreamy. Within minutes the knee pain returned and the tendons were screaming. I asked the group to continue and slowly fought my way through the forest. 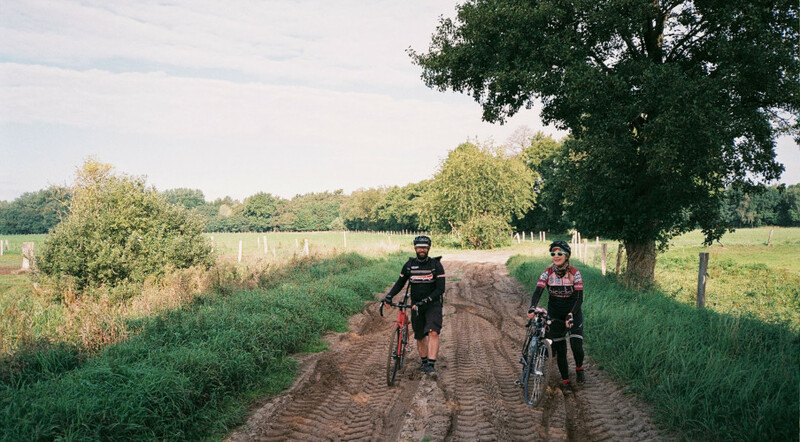 I knew that we were south west of Berlin and was rather confused by the fact that the track started south and not north, but as by now was clear, the point was not to get from A to B, but to ride in nice tracks…or tracks that did not exist just yet. When I arrived to a strange hilly portion of the forest I realized that the track seemed to go through the trees, all neatly and more importantly densely planted. 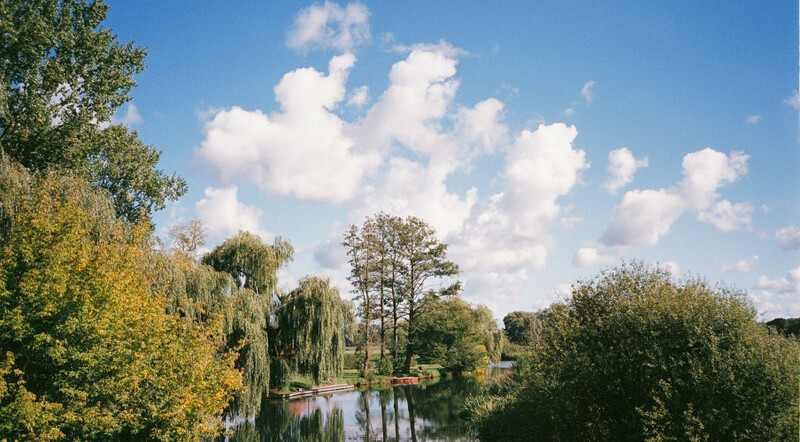 The combination of the various aches and the growing realization that this day, possibly the shortest one, was not going to be a walk in the park, or a ride in around the lake, planted a new thought in my head: do I want to finish this ride and then not ride for weeks and weeks recovering, or should I find a way out. Lucky for me, our singlespeed mountain biker came up behind me and helped the decision process. As a veteran of long rides (the fellow did London-Edinborough-London a few times) he said “take the road, find a train, get off your heels.” I decided to take his advise. I rode to the next small town to find a train station that looked rather deserted. I decided to continue north on the excellent cycling path and take it easy. 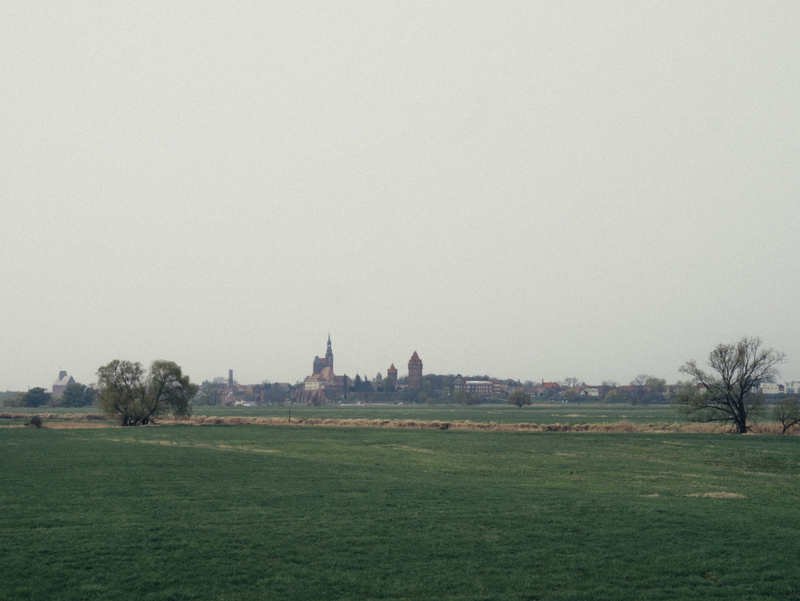 At the next town I stopped and checked the train again and decided that instead of waiting for a train that will bring me to another train station where I will have to switch trains again, I might as well finish riding all the way to Potsdam, where the trains go to Berlin. At the end of the day, I still rode 70km with a barely working right knee and massive pains in the Achilles Tendons. I did not finish the ride as it was planned, but in terms of distance ridden I was on the same mark. From what intel I collected from the team post-ride it seems that pretty much every person had some mechanical issues starting from flat tires and ending in busted pretty much every thing. Ralf, the organizer, actually busted his derailleur and ended up rigging his bike for single speed in the last 10 km. That’s dedication for you! It was first and foremost an epic adventure. 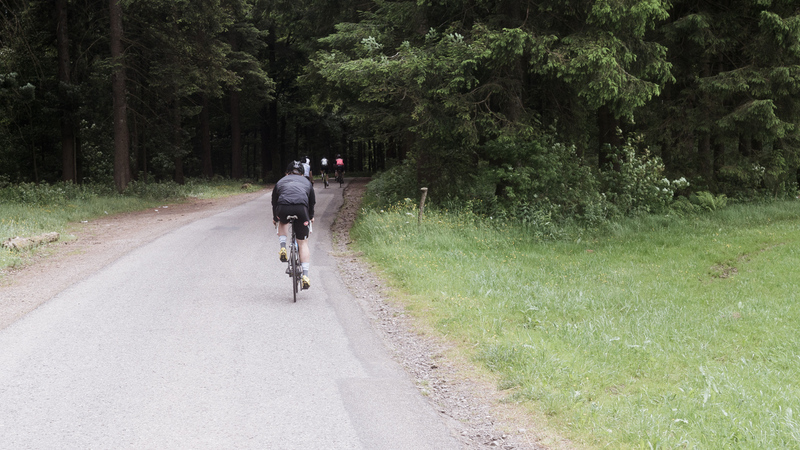 The second day, with its mix of river crossing, forest riding, castles and dikes was truly the pinnacle of tour. 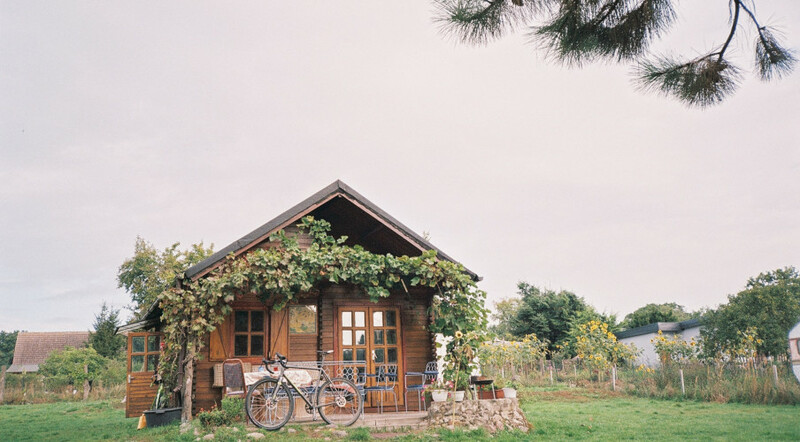 The accommodations, organized by Ralf, were fantastically practical, welcoming, affordable and well placed. 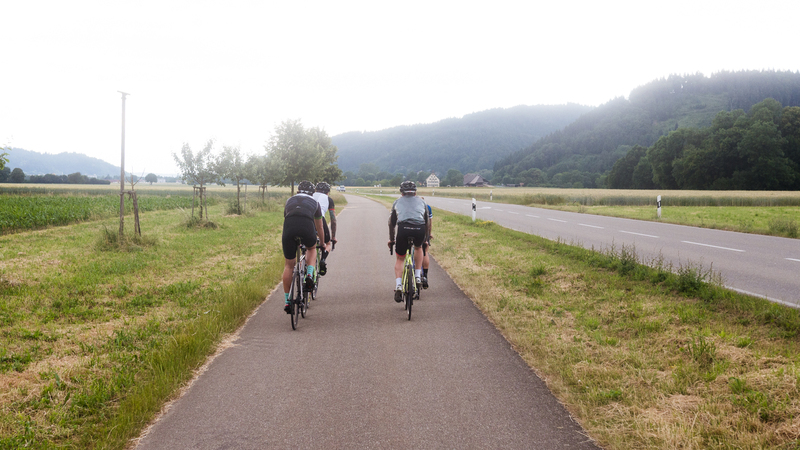 The group, even those whom I only saw at dinner or breakfast was great – tough breed or tri-atheleths, Randonneurs, folks who rode the Grenzsteintrophy more than once and managed to also keep a family of 4 children happy. And here I was, a newbie in comparison, spitting blood and hanging for dear life. Did I have fun? HELL YEH. Would I do it again? HELL YEH. The next time should be easier…right? Waking up in a rather nice hotel in the middle of nowhere in Germany and knowing that the day will end in another similar location and not at home really gave credence to the fact that this was a mini-tour. We met for breakfast, wolfed down magnificent amount of cheese, eggs and coffee, did a quick bike check and headed out. Today, the direction was south. 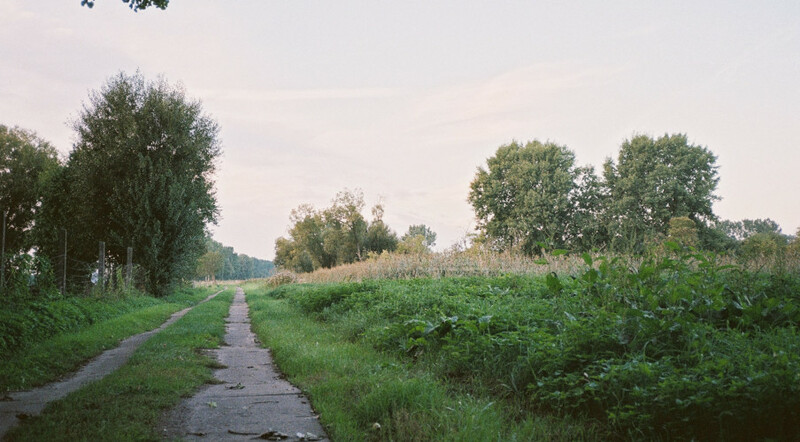 For some truly unknown reason, the path first headed north and then backtracked in the correct direction – south. Before long I was in the forest by myself again. A small group at the front was riding at UCI-approved speeds and I decided that enjoying the ride was a lot more interesting then making it to the next hotel early. 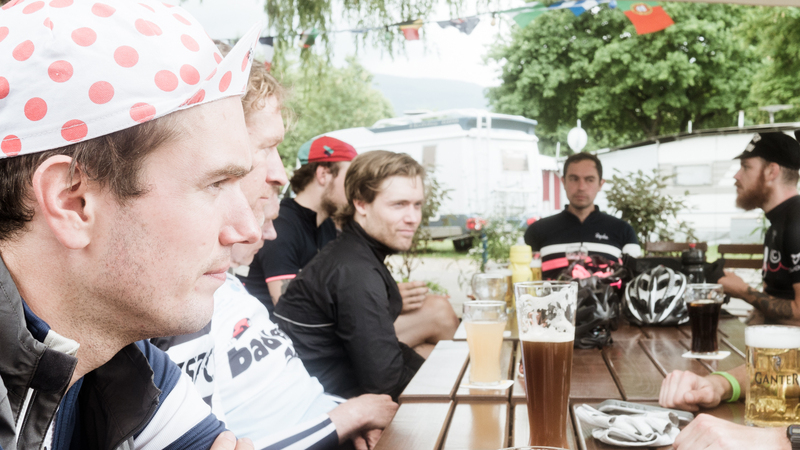 The same team made it to the hotel at 17:00 the night before and preceded to drink beers until the rest of the riders finally assembled which was around 20:00. Those 2.5 hours of drinking are certainly appealing for some, but I rather spend the time in the forest, on the gravel and outdoors. Soon enough I noted that I was riding behind Karsten who was ripping the trails on a very yellow Brodie mountain bike. I figured that two steel horses are better than one so we teamed up and rode together. 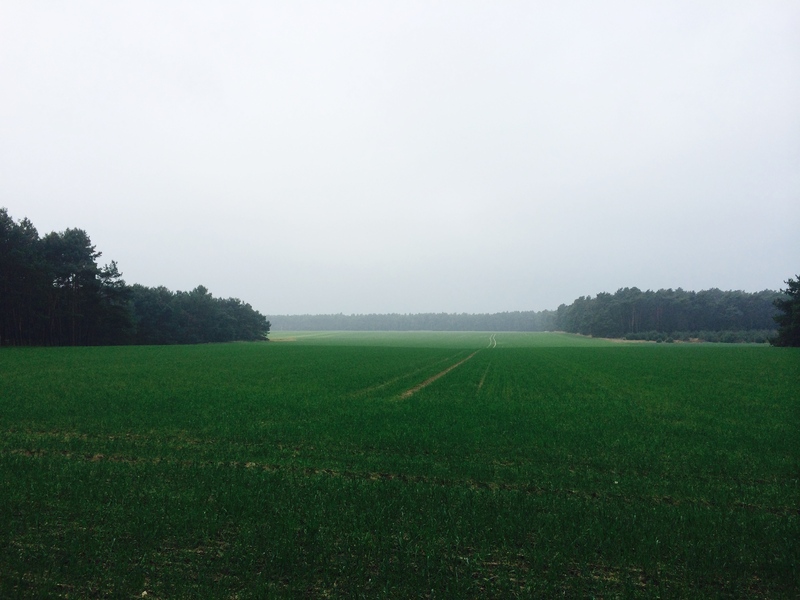 The route alternated again between open fields and forests and was, for me, more exciting than the previous day. 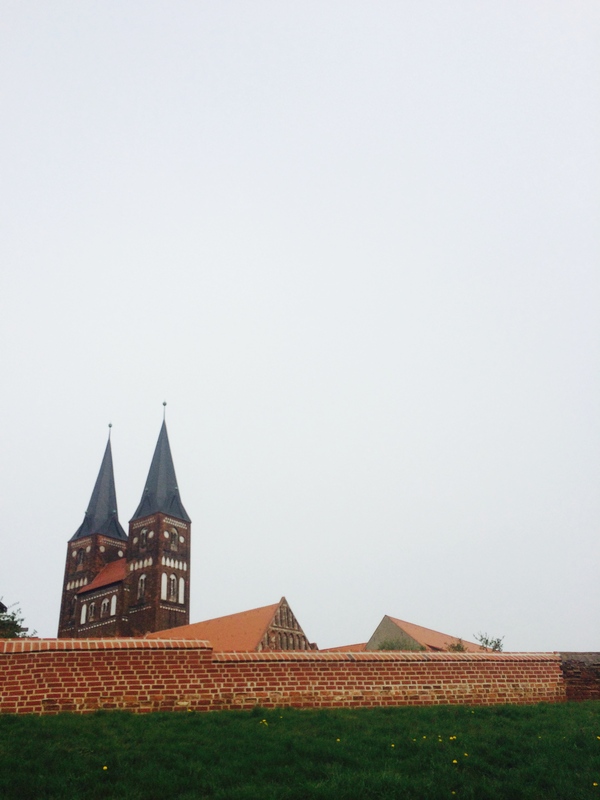 Pretty quickly after we started riding, the tour took us into the next state – Saxon-Anhalt. Here we followed the river Elbe, one of the major rivers of central Europe, in the direction to its origin. We somehow missed a turn which meant that when we got to a place in the GPS track that showed us backing up and riding 15km along a dike. We decided to skip this potential exciting part and continue forward. The GPS track showed that the road would eventually join the original track so we were happy to continue on the same road for a few clicks. About one kilometer after we made this fine decision we reached the end of the road. Here, in order to continue, one had to board a ferry and cross the Elbe. Lucky for us the ferry was waiting just there and as soon as we rode onto it, it took off and crossed the river. 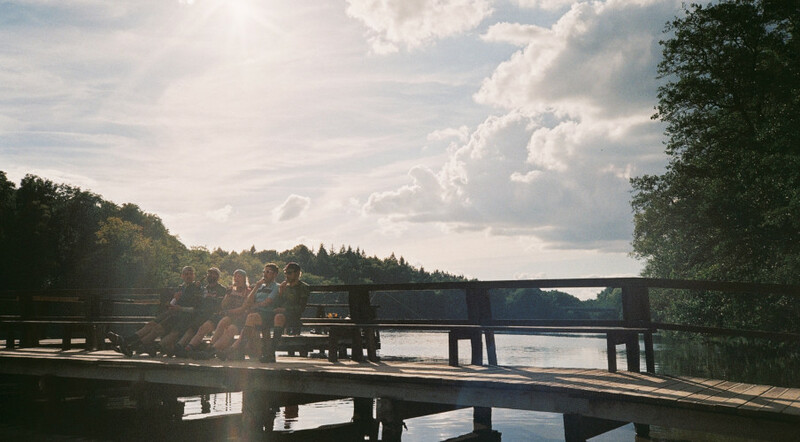 Later we were told that not everyone was so lucky – one of the groups actually had to wait for an hour for the ferry. There were really no further excitements for a while. One of the nice things about following an important river in central Europe is seeing the old castles and fortresses that were setup to guard the trade routes. The Elbe also has a nice bike path that accompany the river which provides a more comfortable view and a little rest from the gravel. It also meant that taking pictures from the back of the bike was possible. We made it to a village called Jerichow after 5 hours of riding, knowing that we have about 80 kilometer more to ride so we decided to stop for a coffee and a quick bite. As we were sitting outside enjoying the french press coffee and salad/cakes combination we spotted Sven who was rolling by and flagged him down. He joined us for a coffee and stayed in our group until the end of the day. As we were leaving the village restaurant in Jerichow, we ran into another group that was behind us. Of course we assumed that we were always the last ones in the pack, but this sudden manifestation confirmed that we were not riding tail. We exchanged a few words but since we were done and then were just starting, we said goodbye and continued. Not an hour later, while riding in a nice gravel path in a forest, the same group came up behind us and from three we were now seven. We stayed together for a while until we stopped to explore something and the others continued. Riding in our little pack of three was great as we took turns conversing, pointing out to interesting scenes and coming up with new curses when the sand arrived. Sven often had to fix his chain, which liked to jump out every now and then and we always waited patiently a little ahead. At 17:00 we stopped again and waited for Sven who came up a few minutes behind and showed us his Shimano 105 derailleur. The cage facing the wheel was gone and he was riding with exposed pulleys! No wonder that the chain did not stay, but this could potentially be a much bigger problem since the pulleys did not give the impression that they would stay where they were for much longer. Lucky for Sven, Karsten had some screw-nuts which helped Sven secure his pulleys and hope for the best. We still had some distance to go and with nighttime getting near, the risk of loosing a derailleur in the middle of nowhere and having to ride at night with no lights, we figured that we should be taking for the road. And so we did. At this point in the ride certain body parts were hurting pretty badly. For some of us that meant the seat bones and for yours truly a strange new pain developed in the right knee. Now, Hunter has been setup as it is for a long while and I have ridden it on many occasions for long distances (like the Camino Norte), so this made no sense. My Achilles Tendon started hurting as well so I was rather happy to be taking the road. In the last hour of the ride I was pretty much riding with my left leg only which exacerbated the pains in the left Achilles Tendon. Boy were we happy to make it to the hotel, having ridden 175 km with a moving time of 8 hours and a total ride time of 11.5 hours. Later on when the next group arrived, riding in the dark through nasty sand, we were very pleased to have made that decision to ride on the road. Sometimes the practical way is the best way. Anyone that knows me also knows that I have a slight problem with bikes and bags. While the bike addiction might be under control these days, meaning that I’m stoked on my current steeds and just want to ride them and not build new ones, the bag addiction is far from gone. My off-road touring monster, Hunter, is very capable of taking front and back panniers. 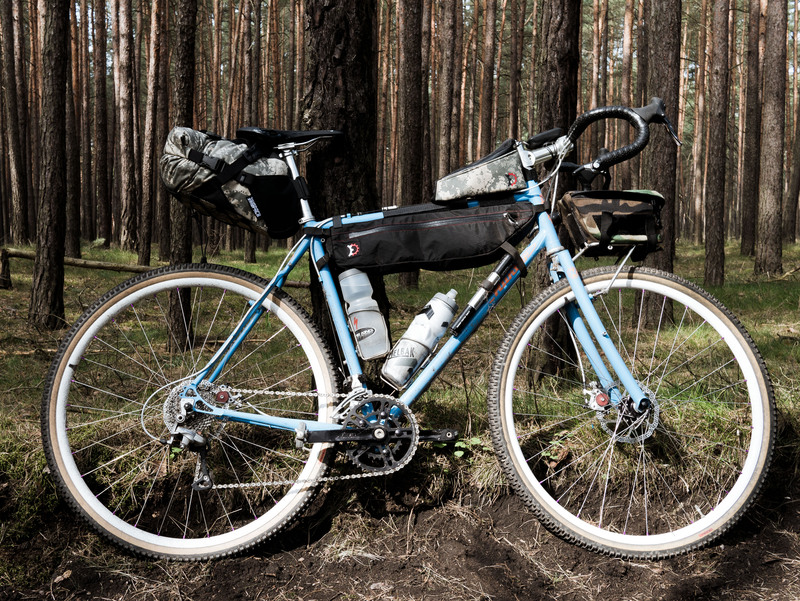 But when riding off road or completely not on any roads, I find that panniers tend to get in the way. So I was looking for alternatives and came up with the setup displayed above. BikePack RePack C. This baby is amazing and is the place where everything that’s not needed during the day is stored. 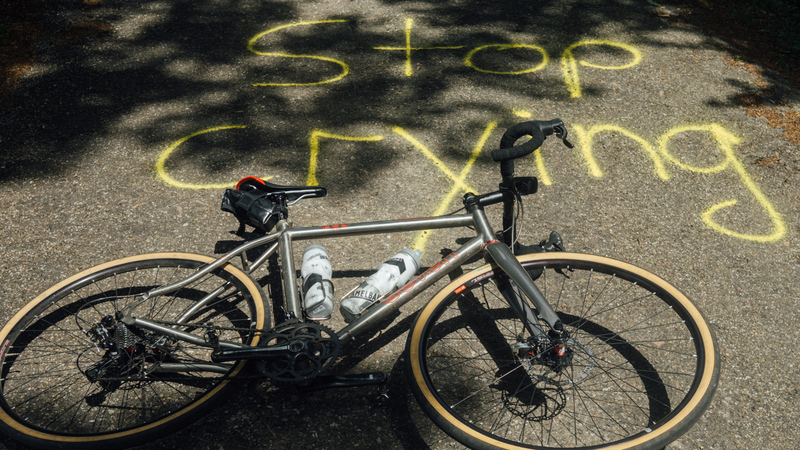 In the case of a recent three days tour that meant extra base layer, jersey, touring shorts, bibs, socks, toiletries, chamois creme, sleeping gear and what not. It sits solid without swaying at all, had way more space than I actually used and of course, for this specific model, comes in cameo. From a European perspective, this is the best deal one can find – Pawel who produces them in Poznan, Poland, is a solid dude, ships super quickly, and is very reliable. The price of the bags is 65 Euro which is simply unbeatable. I can not recommend this bag enough and no I am taking no kickbacks from Pawel. Revelate Designs Tangle Frame Bag and Gas Tank. The Gas Tank is used for one purpose only: to cary my Panasonic GX7 camera with a 20mm (full frame equivalent 40mm) lens. 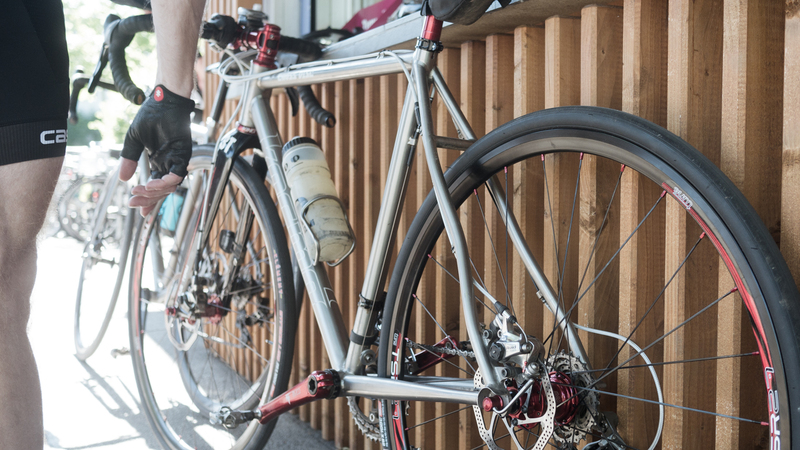 I like the shape of the Gas Tank and the fact that it is wider than the similar top tube bag from BikePack, but the latter was not wide enough for a camera. 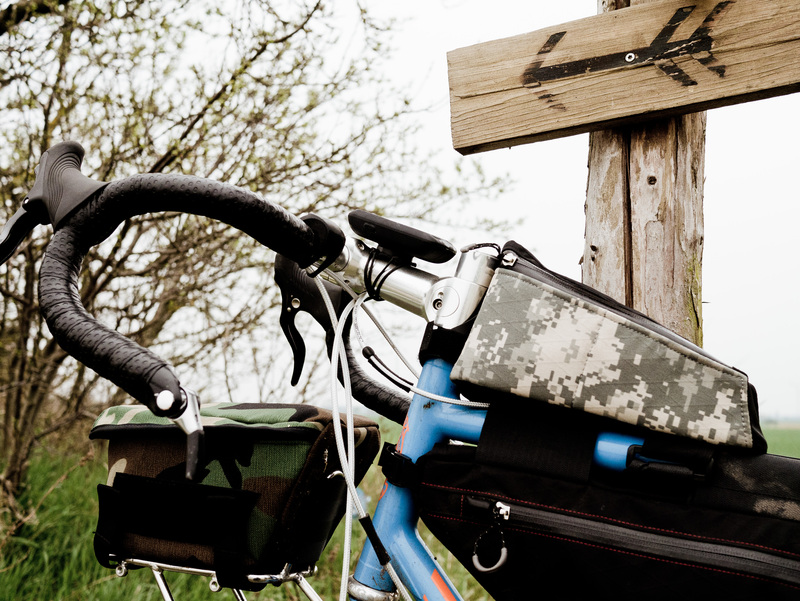 The Tangle Frame Bag has two sides. The right side is where I keep all the snacks, gels, sandwiches, nuts and power bars. 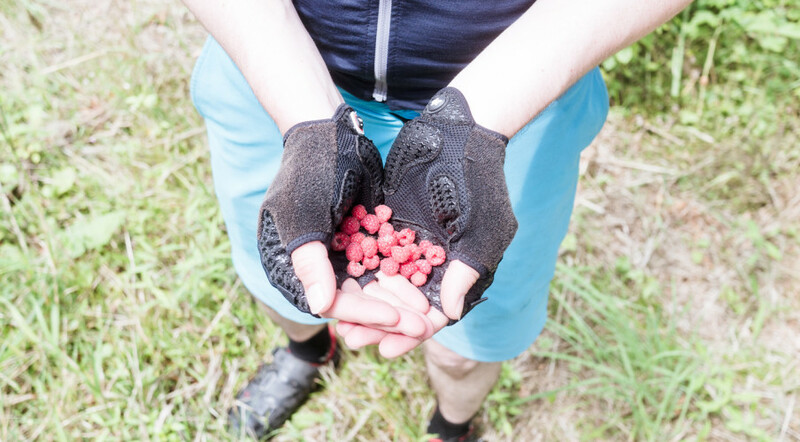 It’s easy to open while riding and has enough room for bulky bags of dried fruits as well as bananas. It’s my goto side on a ride. The left side is slightly more shallow which is why I keep all the tools in there. It accommodates two tubes, tools, patch kit, a few lights, pens, iPhone charger, cables etc. It’s my garage when I’m on the road. Bailey Works D Rack. Bailey Works are located in New Hampshire. I saw the D-rack mounted on one of the Ride Studio Cafes show floor bikes and fell in love with it. I was shocked to find out that Bailey did not actually offer it as part of their standard offering. I did a lot of searching until I found out that one has to email the guys and ask them for one. Within two days after I asked for it, it arrived, in cameo of course, to my U.S. address. Why do I need it? I don’t really, but I tend to keep things like gluten-free bread in there, a charger battery which I use when the Garmin runs out of juice on a long ride and other what not. It rests comfortably on the Velo Orange Pass Hunter Rack and at times is the only storage I take when riding. It’s not too big, but I like the way it works. The same rack should really be used to host a randonneur bag…that will be the next bag purchase. It’s really not cheap or easy to get some of these bags in Europe. Shipping Revelate from their home in Alaska to Germany will take a lot of time, will include high cost of postage and possibly will involve the friendly customs people. BikePack makes frame bags – both custom and standard which could work well (I have no personal experience there) – this could be considered a good alternative. Other than this, feel free to let me know what other European alternatives you know of. 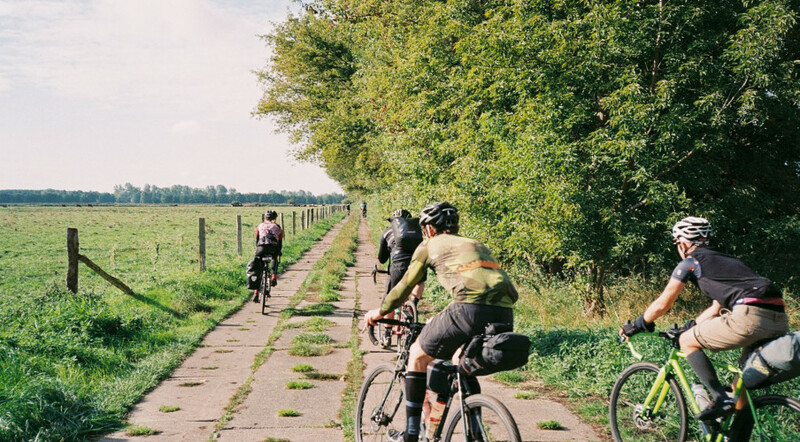 Often, especially on beautiful spring days when conference calls are piling and the window is slightly open, I get envious of people who find a way to turn their life into something that is completely supported and centered around riding bikes. People like John Prolly, the nice couple of The Path Less Pedaled and the lovely Bicycle blog come to mind. 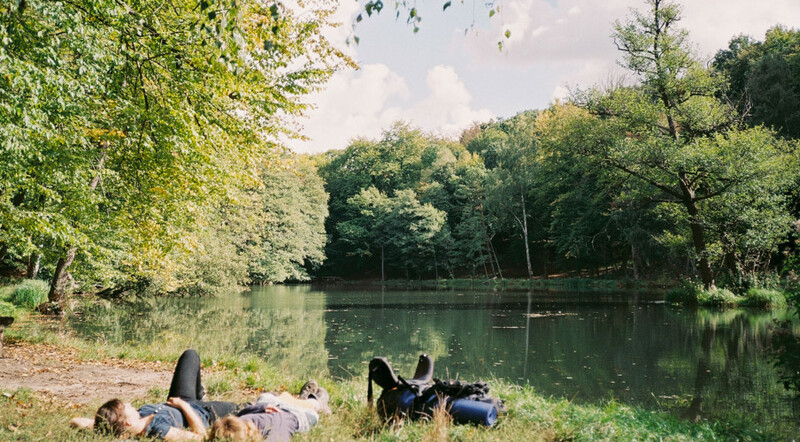 It seems like the best life style one can have – wake up, ride, eat, write, develop photos, eat, sleep, repeat. 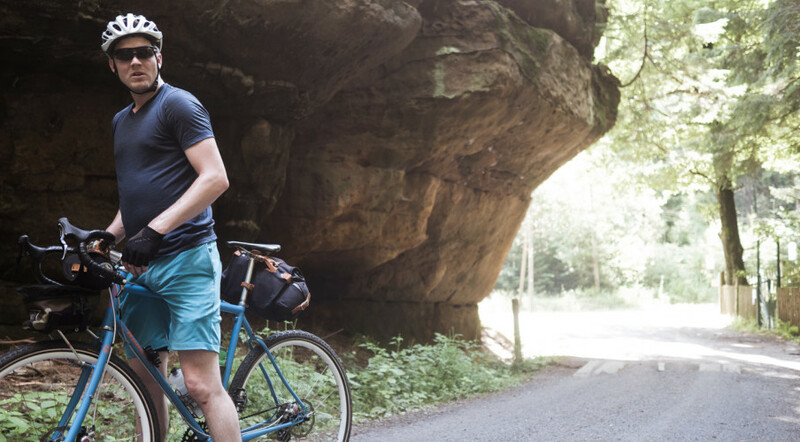 Being immersed in not just the Internet side of biking, but also in actually riding bikes, touring, exploring, seems like an ideal way to spend life. The bike needs the office and the office needs the bike. They balance each other and make life round and complete. Life, just like a bike, requires a rider who can balance.